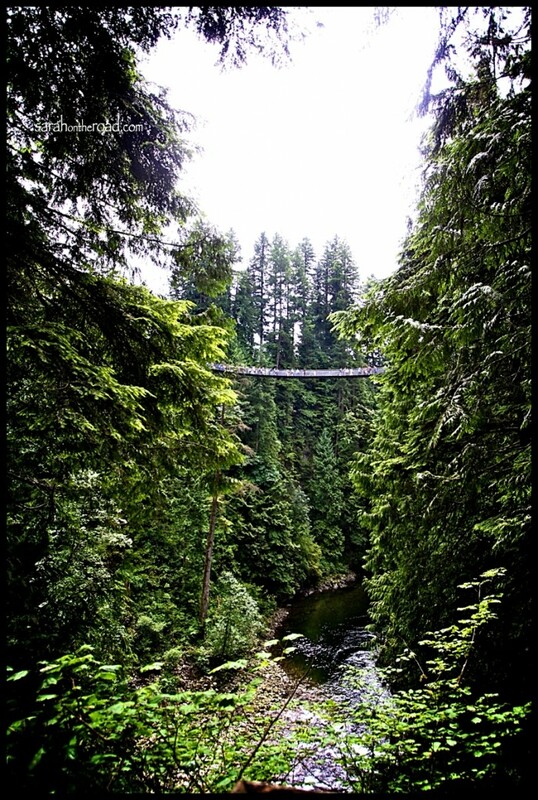 After our first awesome day exploring together, Ryan picked me up in his van.. and we drove over to the Capilano Suspension Bridge. It was a WET-RAINY morning…I might have been in a grumpy mood, partly because of the weather, the time of day and I hadn’t had breakfast yet. Well after arriving at the Cap Bridge, I had something to eat…the time was a more ‘decent’ hour…and well there was still RAIN. 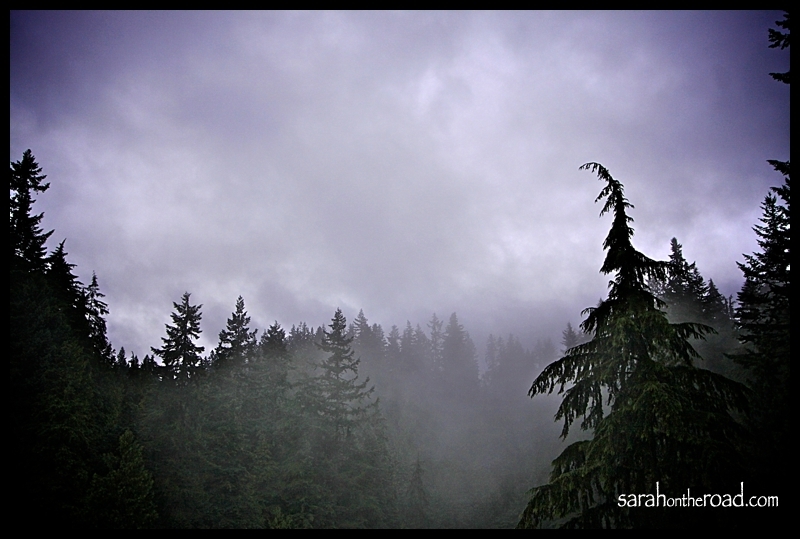 But after all, I suppose in a Temperate Rain Forest-there should be rain! 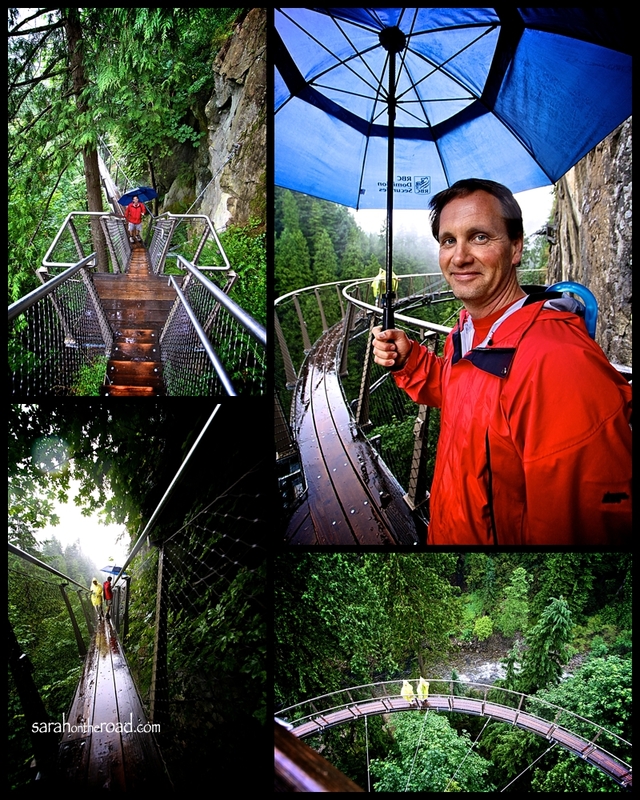 Ryan and I decided to explore the ‘cliff-walk’ area first… It was raining so hard! 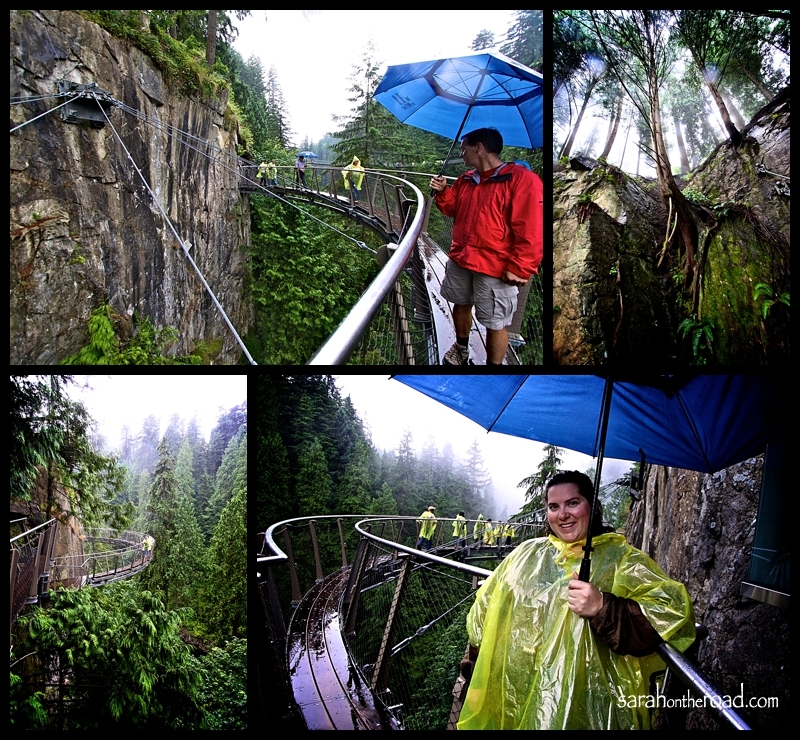 Ryan used an umbrella…and I used one of the wonderful yellow rain jackets provided to me from Capilano Suspension Bridge Park. It was so cool to see how the ‘cliff-walk’ was attached to the side of the canyon! Looking at trees in the rain! I was soaked, my lens was covered in rain drops by this point… so that’s why there are ‘splotches’ on these photos. Ryan and I ducted into the gift shop… I dried off my lens, then we headed to the front gate to catch a ‘historic story tour’! 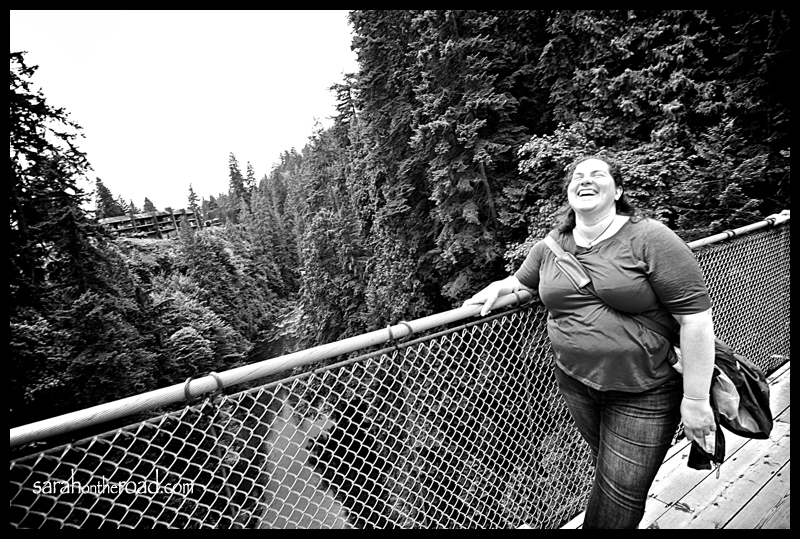 Rebecca was our ‘story-guide’… and she told our small group the history of Capilano Suspension Bridge. If you are interested in knowing more, click HERE! See that rope Rebecca is holding in the 2nd photo? Well that’s what the first bridge was made out of… I don’t think you’d catch me on that bridge! Peter shared some knowledge around First Nations Culture. About how they used trees to build houses, Totem Poles (or Story Poles) and dug out canoes. 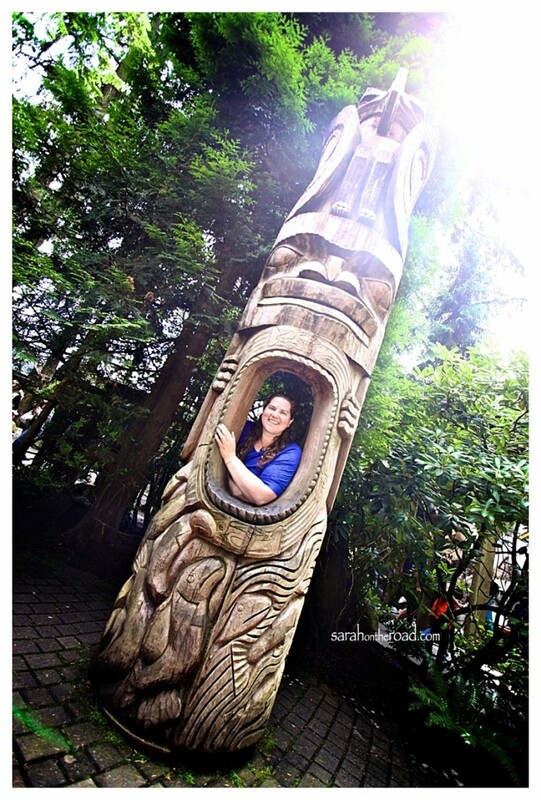 One new thing I learned was that Totem Poles are actually “Story Poles”…Peter called the Totem Pole below…and “Interactive-Pole” because you become part of the story… when you put your head in the hole! 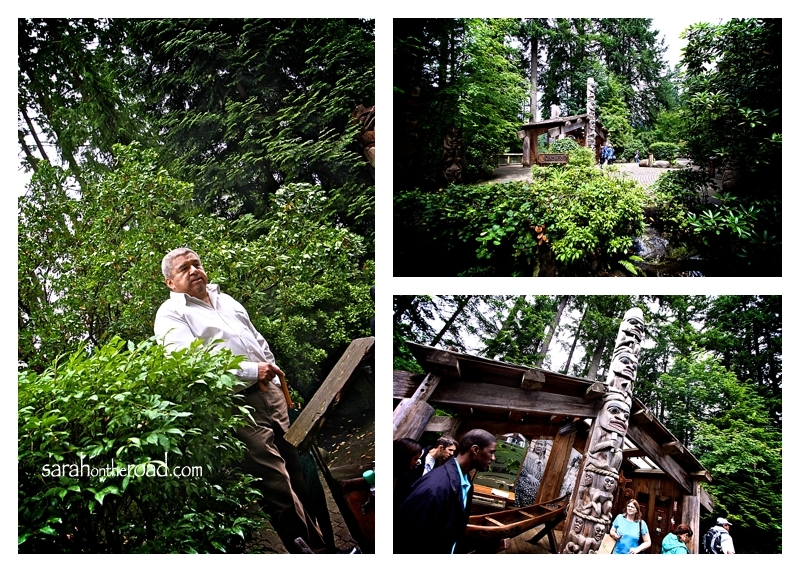 He also mentioned how it’s one of the most photographed Totem Poles! Just as we were ready to cross the bridge, the sun came out… and the rain stopped! I must admit, it was a wee bit scary but once I was on it I was alright. It did swing/sway as you walked. Oh and there were TONS of people on it at the same time… that was the ‘crazy’ part! Graham took our small group on a brief nature walk to explain more about the Temperate Rainforest…and how everything works together to live. I learned lots from his talk…and he was very passionate about the park and job! 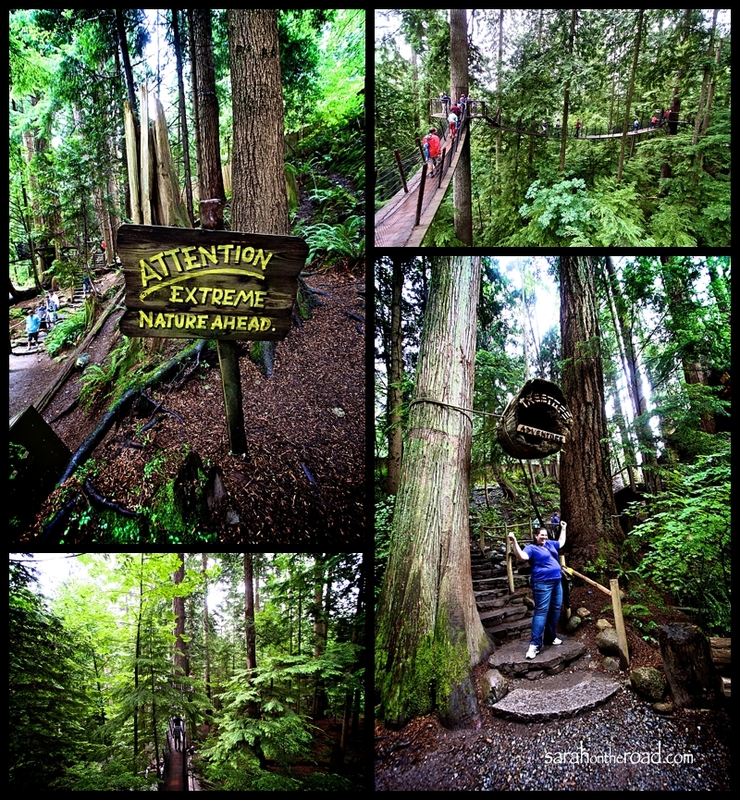 There are three types of trees at Capilano Park… Douglas Firs, Hemlock and Western Red Cedar. 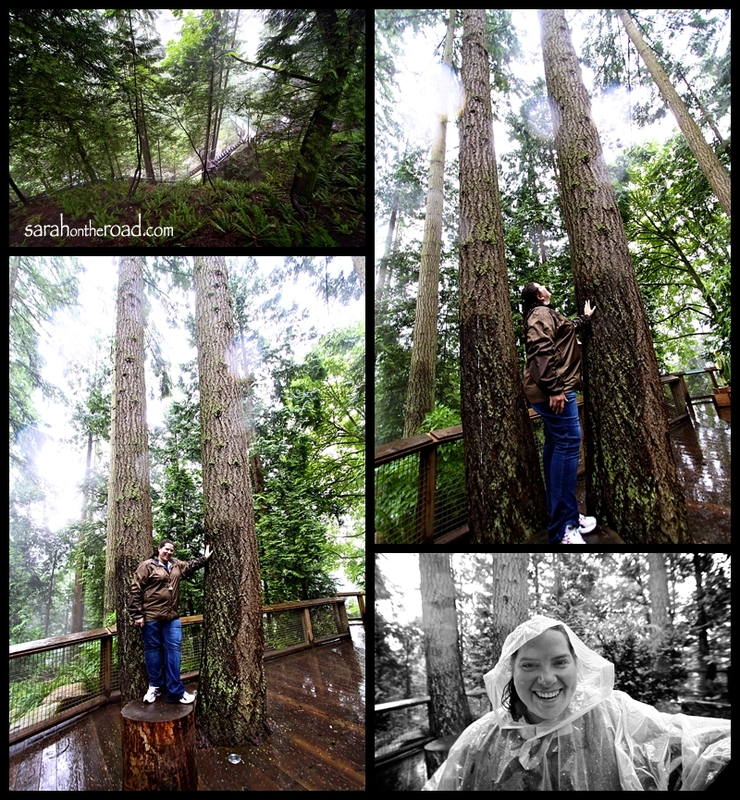 After the nature walk/tour was finished… Ryan and I headed up into the trees for a little ‘tree’ walk. 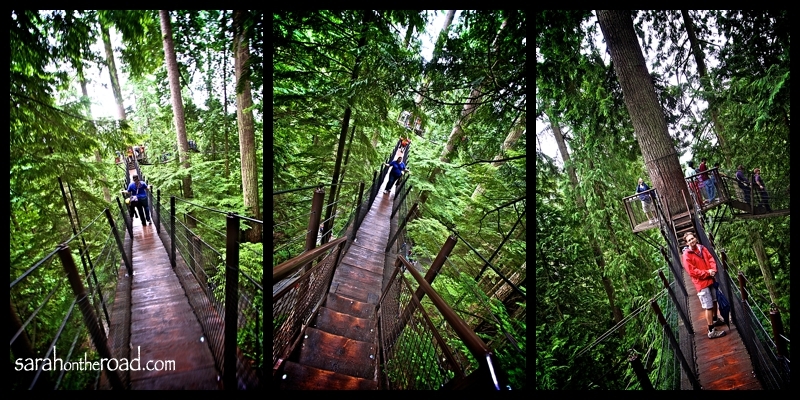 It was an awesome walk, from one douglas fir tree to the next, via a series of mini-suspension bridges! We did stop to eat our Rogers chocolates up in the trees! It was a LONG way down….at some points on this walk we were 30m (100feet) in the air! 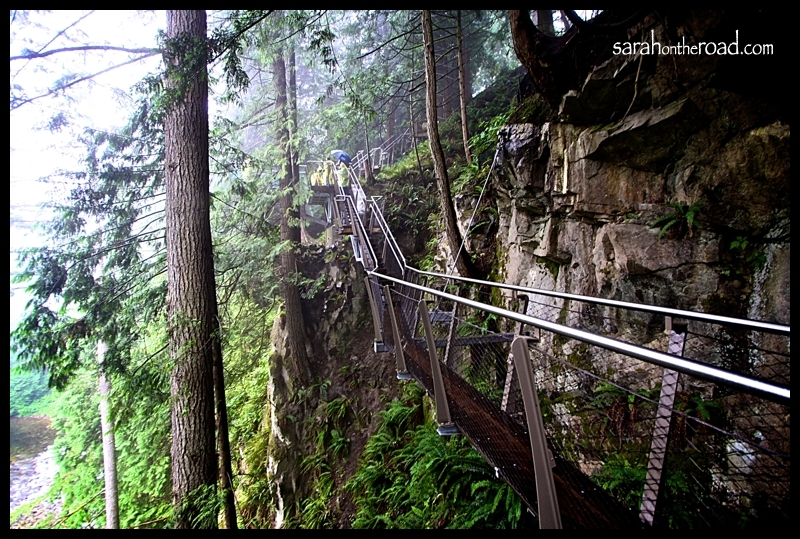 I wouldn’t recommend this walk if you were scared of heights! I’m not really scared of heights, just scared of getting down from ‘heights’ but I was alright…because getting down was a gradual process! After we got down we walked around exploring the trails a bit more… we might have played hide-and-seek behind the trees! 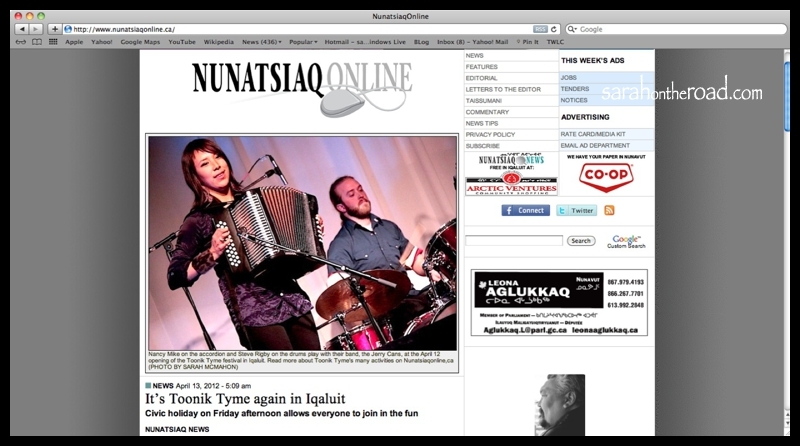 I don’t think Ryan could manage living in Nunavut…being out of “smart-phone” cell service. It was a fun day were often we were talking photos with our phones, and uploading them to Facebook, Twitter and Instagram! 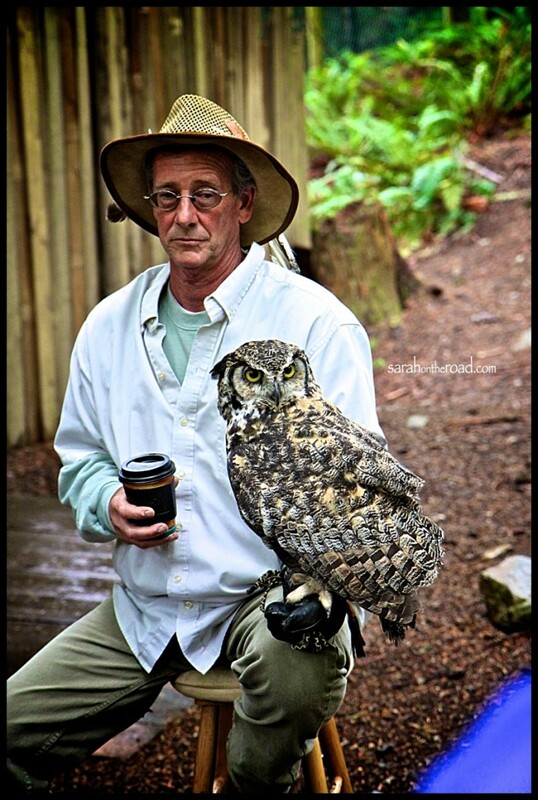 I know in the above photo Ryan was uploading his version of a photo of this owl on Facebook. From this perspective you can get a sense of how HIGH up that bridge is! 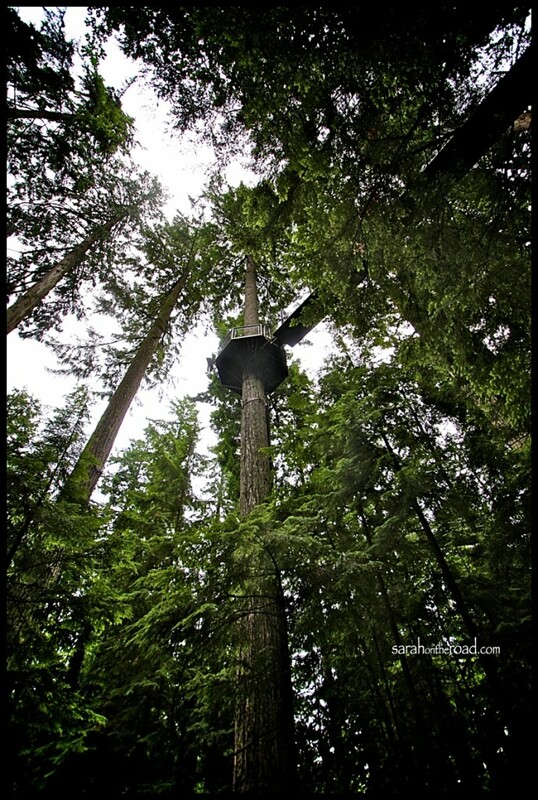 Looking up at the one of the parts of the ‘tree-walk’…from the ground! Number 16 on that list was: “Laugh until my belly aches, and I forget what I was laughing about (then repeat)”. Thanks Ryan for capturing me mid-laugh! 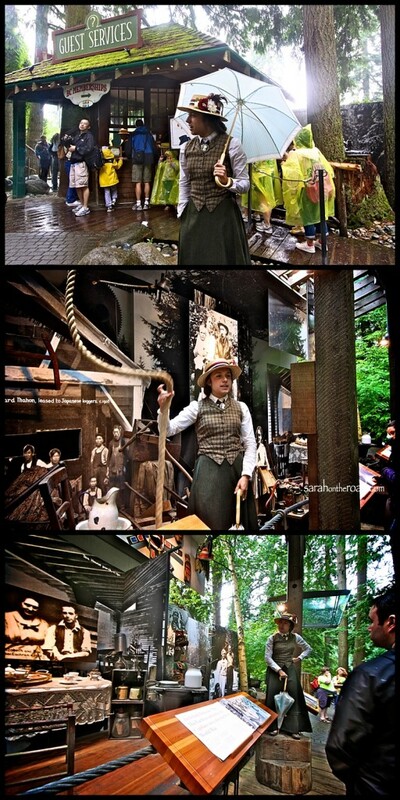 Loving the ‘props’ for the staged tourist type photos…. who doesn’t love to ‘strike-a-pose’ in a GINORMOUS Picture Frame? 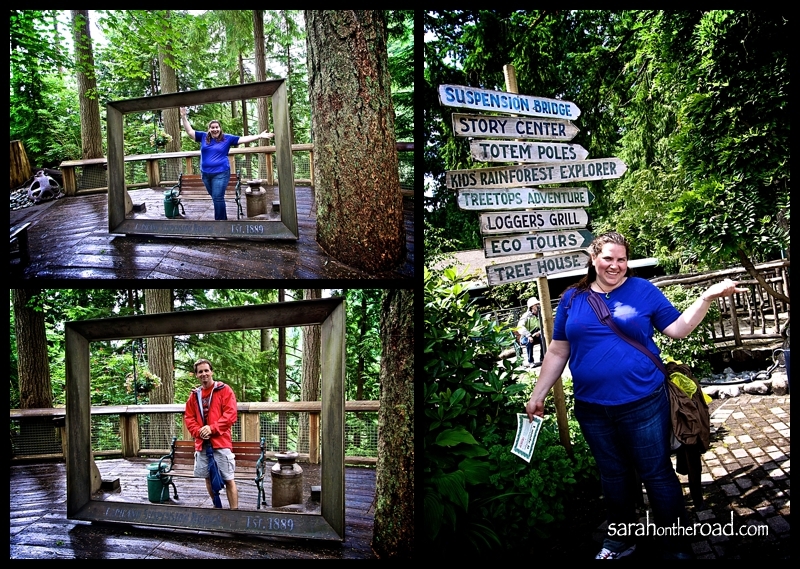 One of the fun challenges during our time at the Capilano Suspension Bridge…was to find all the “stamps” in the various areas of the park. 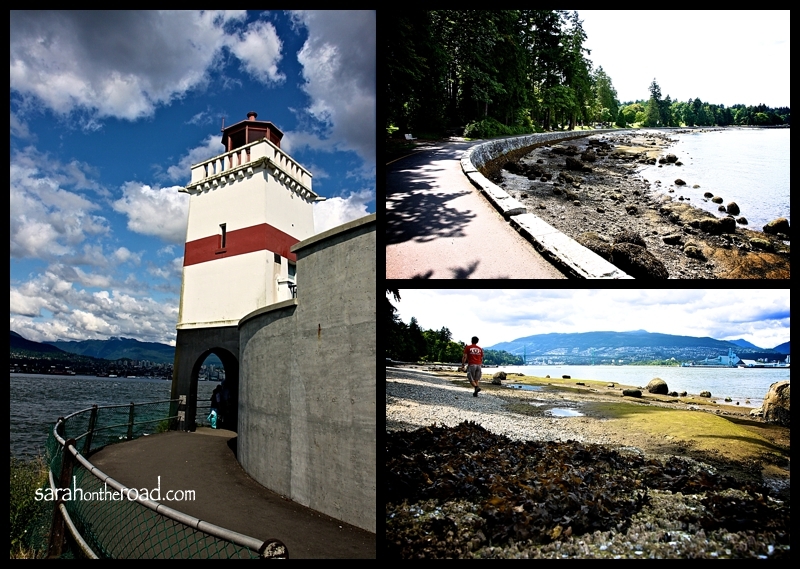 Once we finished, we went by Guest Services…to get our “I Made It Certificates!” The Cap Bridge was such a fun place to explore… it is a bit ‘touristy’ but I’d still recommend visiting if you get to Vancouver. 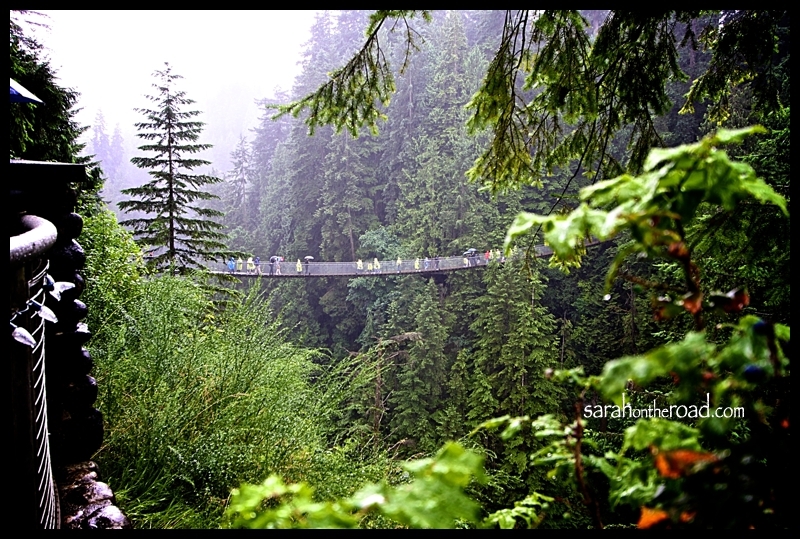 …our time was done at the Capilano Suspension Bridge but have no fear, there were other places Ryan and I were heading…on this crazy ACTION-PACKED DAY! 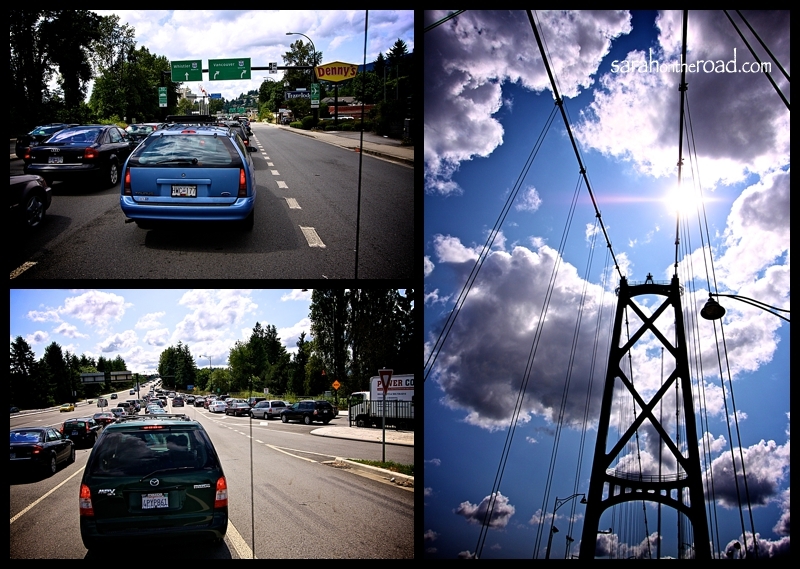 I had my first introduction to traffic in Vancouver…the Lions Gate Bridge had one lane closed…(there had been an accident)! So as you can see there were 5 lanes merging into 1-can we all say CONGESTION? Then we drove through the park, stopping at various places to check out the views and snap some photos… one of these stops was “the Hallow Tree”. 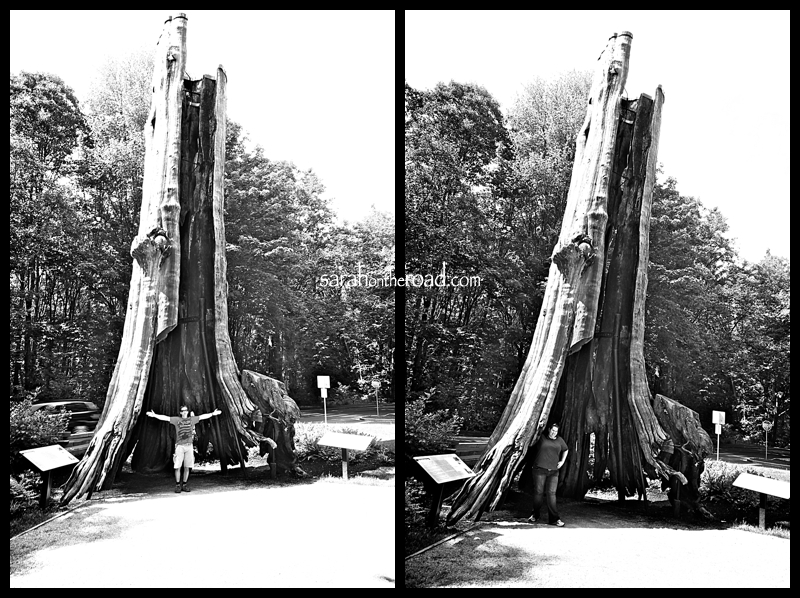 Located along the west side of Stanley Park Drive, the Hollow Tree has attracted visitors and dignitaries since the earliest days of Stanley Park. 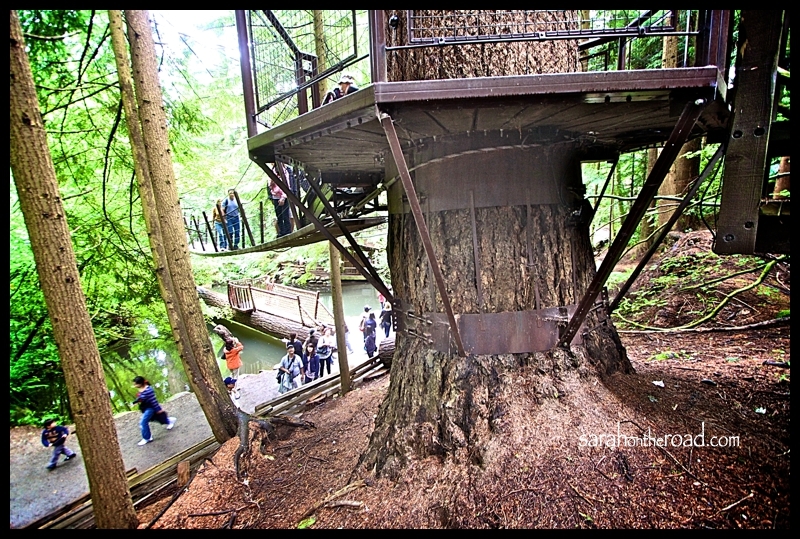 As one of Vancouver’s oldest and most famous landmarks, the Hollow Tree has been an important part of Vancouver’s tourism industry since the city was founded. Each generation has its iconic photos demonstrating the immensity of the Hollow Tree. Everything from an elephant, to horse-drawn carriages and the earliest automobiles have been photographed next to the tree. The Hollow Tree is a cultural heritage resource listed on the Vancouver Heritage Register and the Vancouver Heritage Tree Inventory. We parked near this lighthouse…and went on a walk along the sea-wall for a little while. 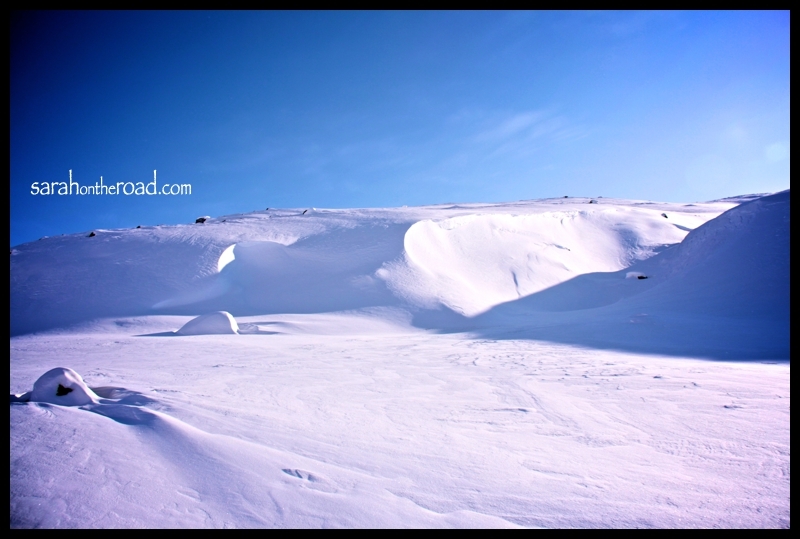 It turned out to be SUCH a GORGEOUS day… seriously was so thrilled it was sunny and warm! 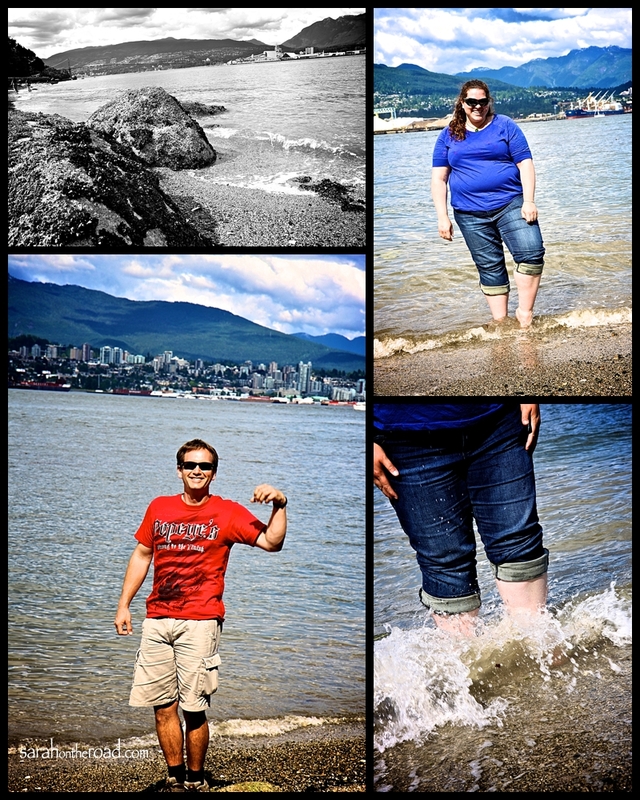 I needed to put my toes into the sea-water!… Ryan decided he didn’t need to get his feet wet! 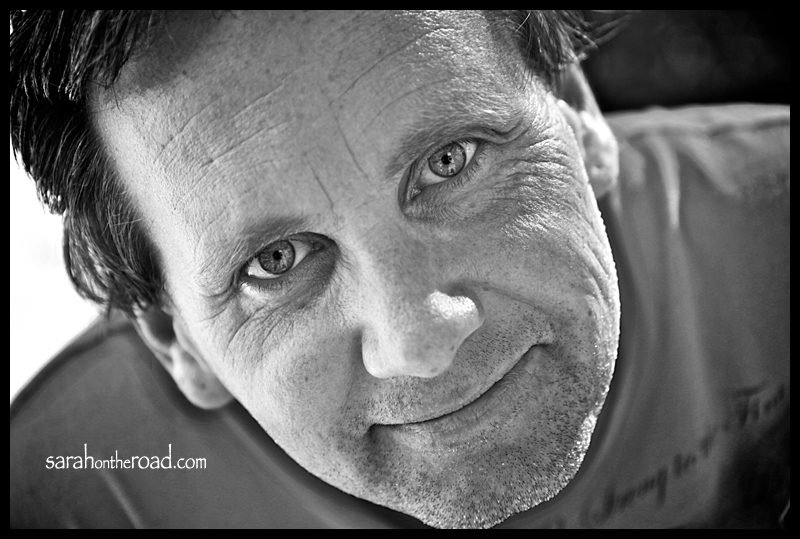 I took some portraits for Ryan in the summer of 2010… he wanted me to take some more. 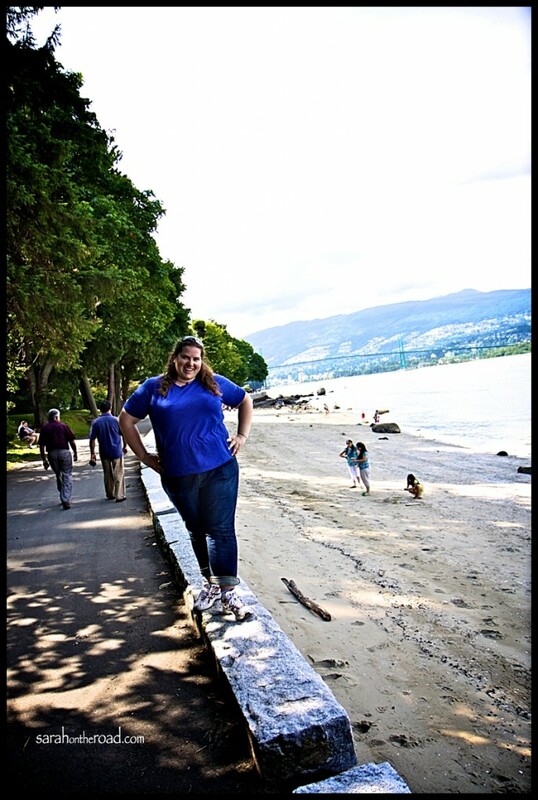 We didn’t do a ‘formal’ photo-shoot…but I did end up with some fun candids… and this image! 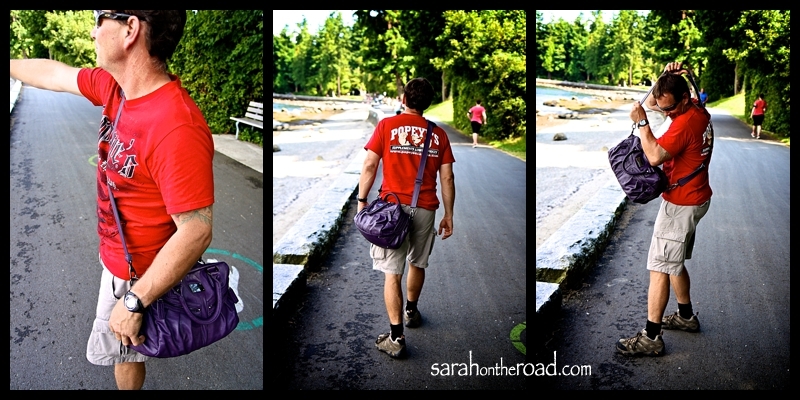 After we left Stanley Park, we made a quick stop at Mountain Equipment Co-op (MEC)… Ryan needed some rock-climbing supplies! Then we headed to the movies… Ryan and I ended up going to see “Magic Mike” in the VIP Theatre. Just wanted to note that he asked me and then let me decide which movie, because I rarely get to the theatre. The only movie I wanted to see was “Magic Mike”–so well Ryan ended up seeing it too. Honestly the script was pretty pathetic predictable, but the visuals were great! Thanks Ryan for showing me around your new city! I had a blast… and I don’t think I’ve laughed like that in a long time… Thanks for all the shots you took of me during our adventures. Until our paths cross again my friend, stay safe! 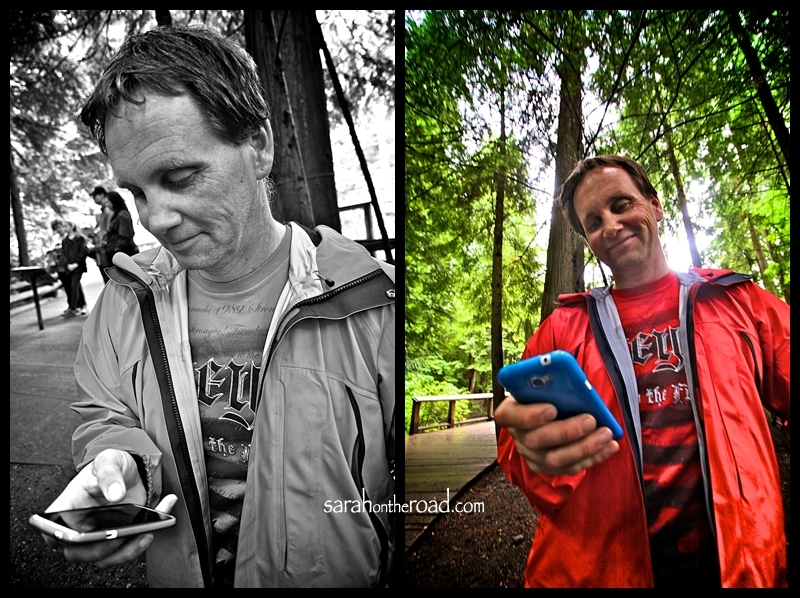 Please Note: all photographs of me in this post were taken by Ryan Bealer, except for the obvious ‘self-portraits’! 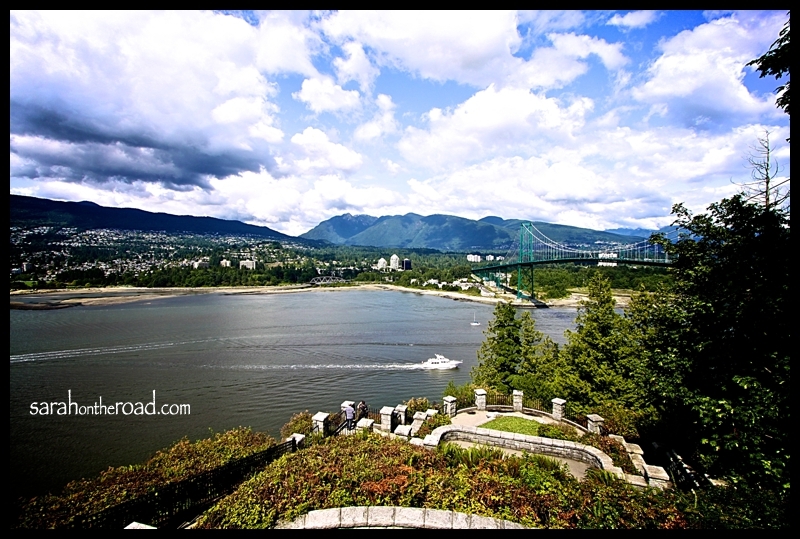 This entry was posted in Friends, Travel in Canada and tagged 32 Things to do by the time I'm 32, Vancouver on July 27, 2012 by Sarah on the Road. 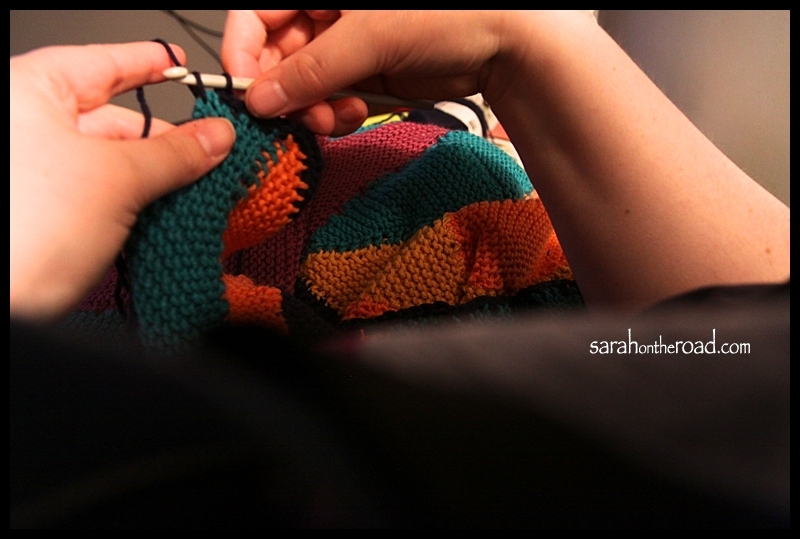 When I moved to Pang in 2009, I brought heaps of yarn… and made heaps of baby sweaters. 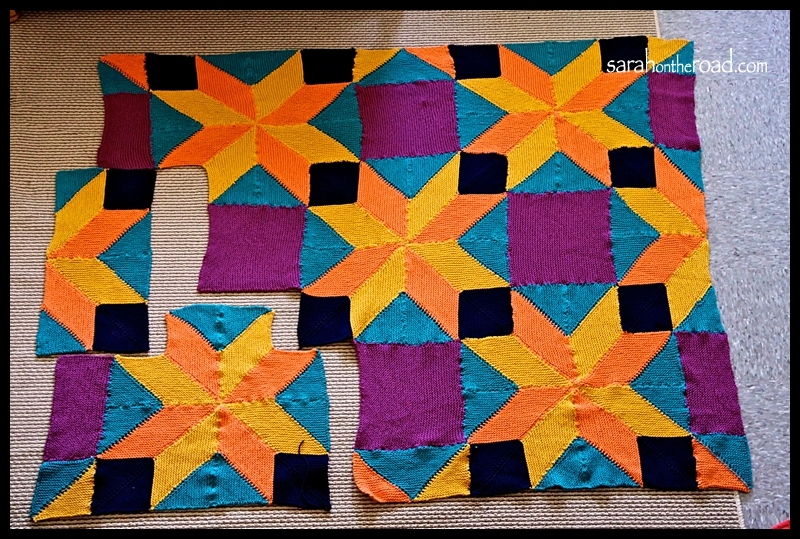 It was a short, easy project…and are DARN cute! These small projects were perfect to carry around with me when I was travelling! 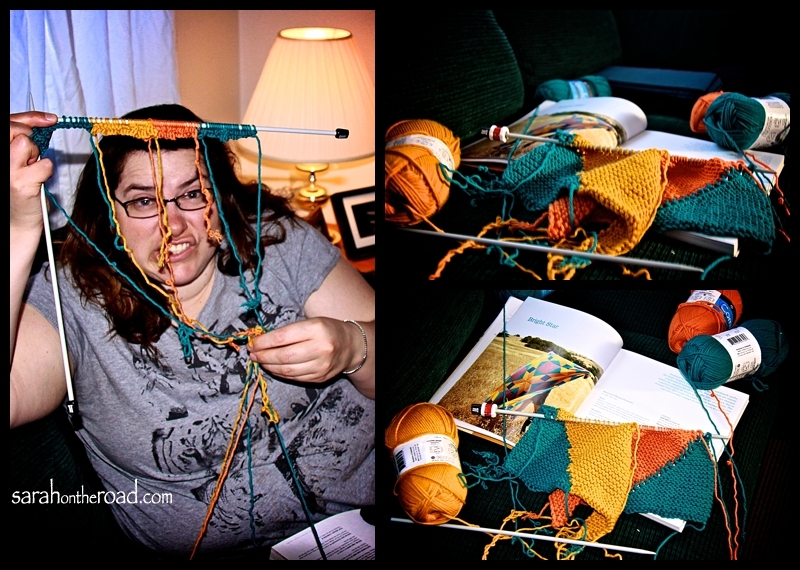 This past fall a friend and I started getting together once a week to knit and watch tv. 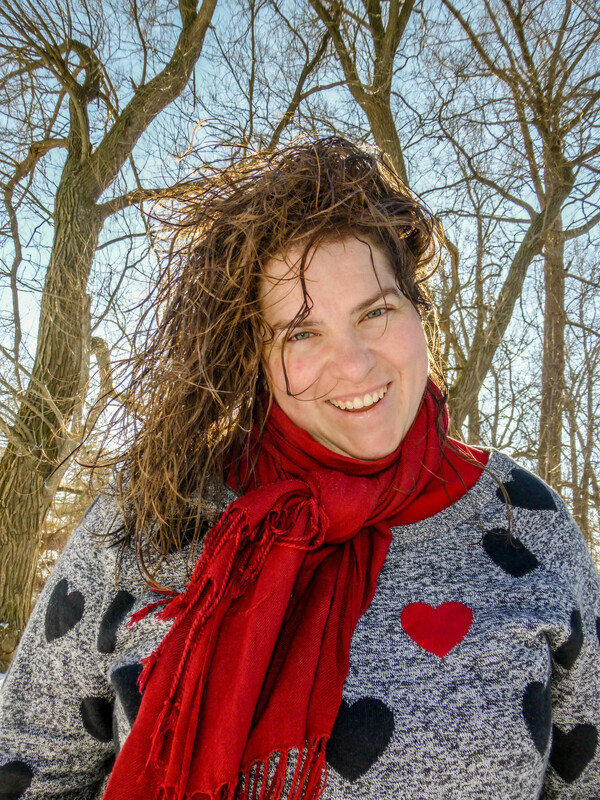 She’s an amazing knitter… week after week she brought different projects to work on- sweaters, scarves, socks… you name it she knit it! 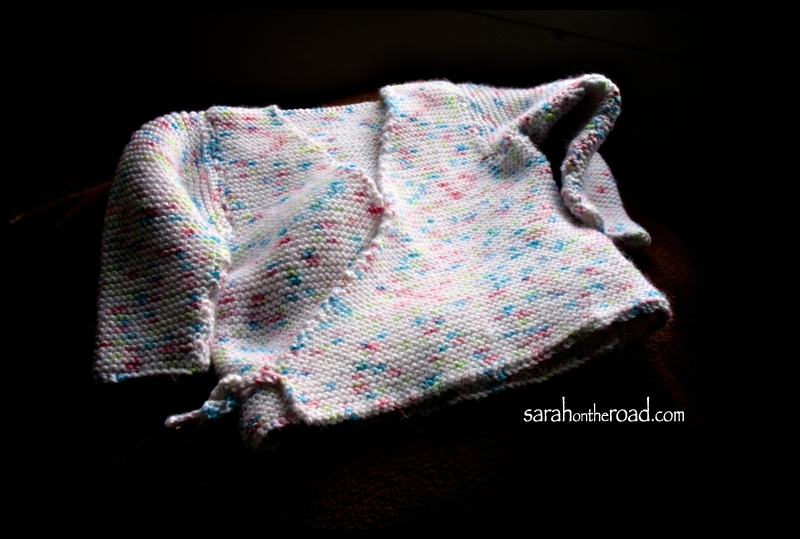 I on the other hand…was stuck in the ‘baby-sweater’ knitting rut. It wasn’t a bad place to be stuck…but well I have no use for them! 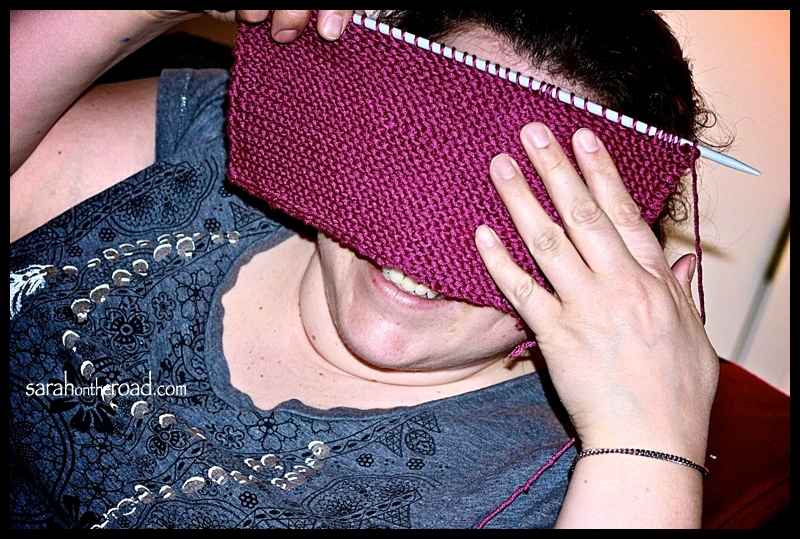 One night my wise knitting friend asked me why I had never done a project for myself. I didn’t have a good answer… I looked through a few books she had brought along. That’s when I decided to make an afghan! Knit an afghan became #3 on my 32 Things to do when I’m 32 list. Then next step was to get the yarn. While I was on holidays my friend Erin and I headed out on this quest. We were pleasantly surprised to find London Yarns a short drive away from her house! The two women that worked there were SO friendly and helpful! 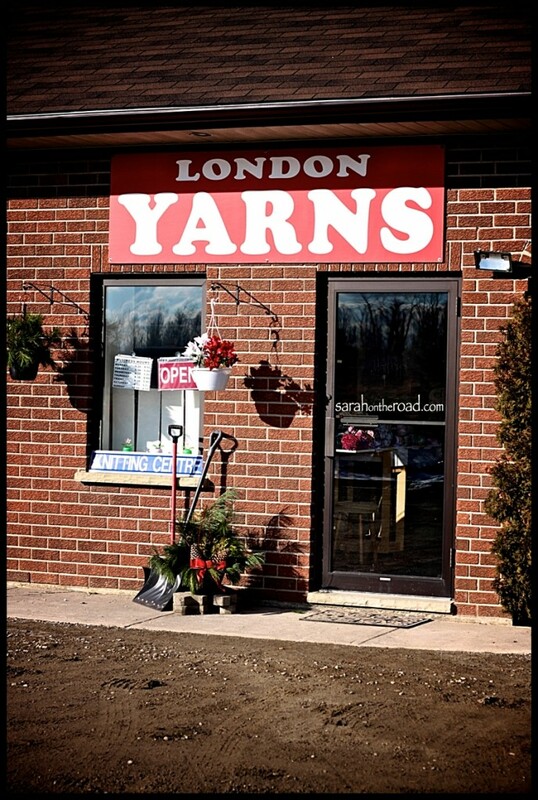 I quickly had all my yarn, new needles and the afghan book… I highly recommend checking this place out if you are in London, Ontario. 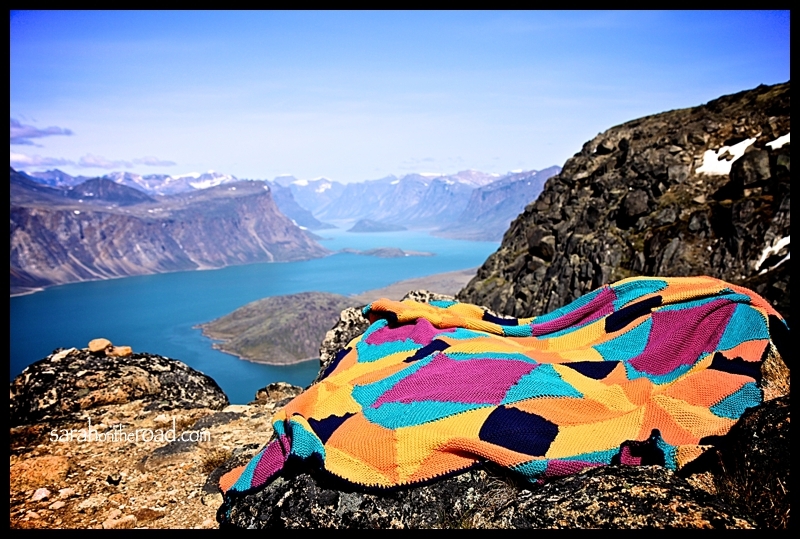 I managed to put all my yarn into my luggage and fly it back to Nunavut. It stayed there until after I was done 2 other projects. I was finally ready to get started the weekend after Easter! It was a bit daunting knitting with 4 balls of wool-but once I had a system I didn’t get too many tangles! 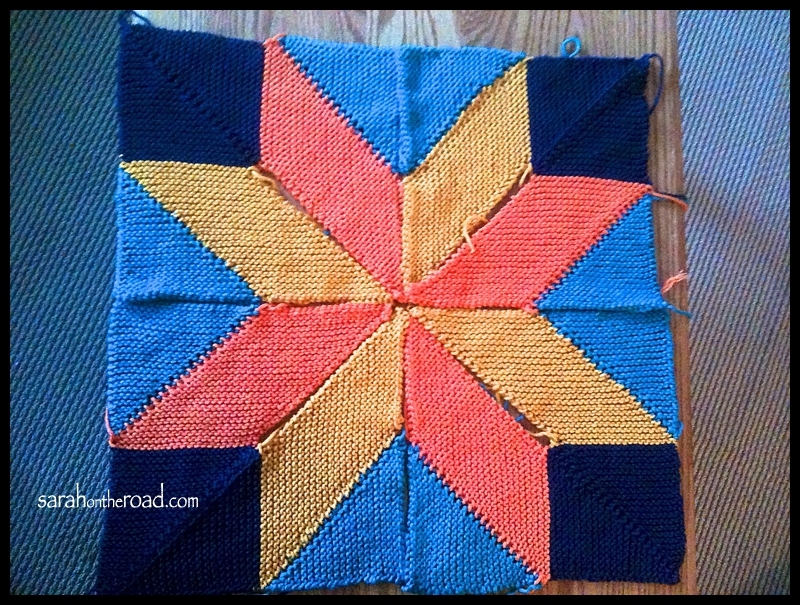 Soon I had 4 squares done for the centre of the Afghan… I was so excited to see the project coming together. But at this point I realized how much sewing together I’d have to do! 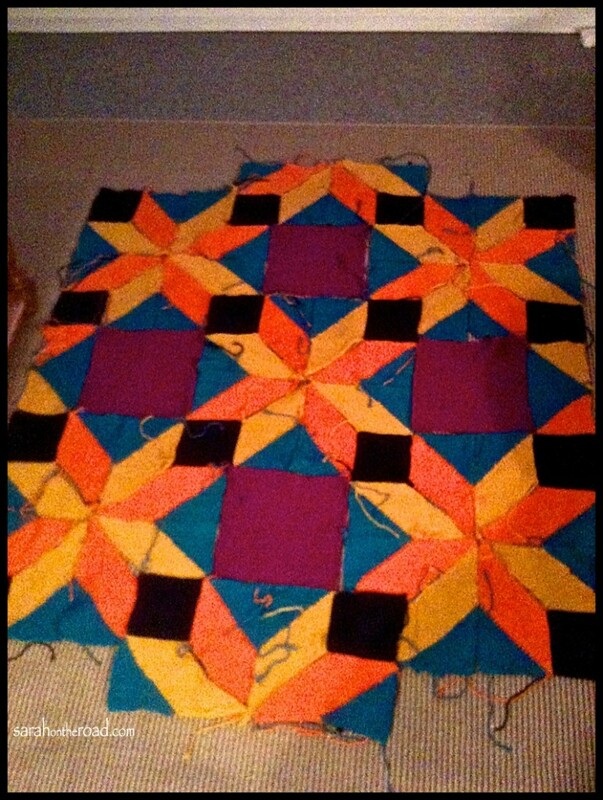 Getting close to finished… It took so long to sew it together, next afghan won’t be done in pieces! The last thing I had to do was crochet around the outside edge to finish it off. I asked a woman at work if she could help me. She showed me over break… It was a slow process… I didn’t want to mess it up, but over the next 3 nights I worked on this last step! Yes, I’m slow… I need to do another project to learn some more crochet. And then I was done. 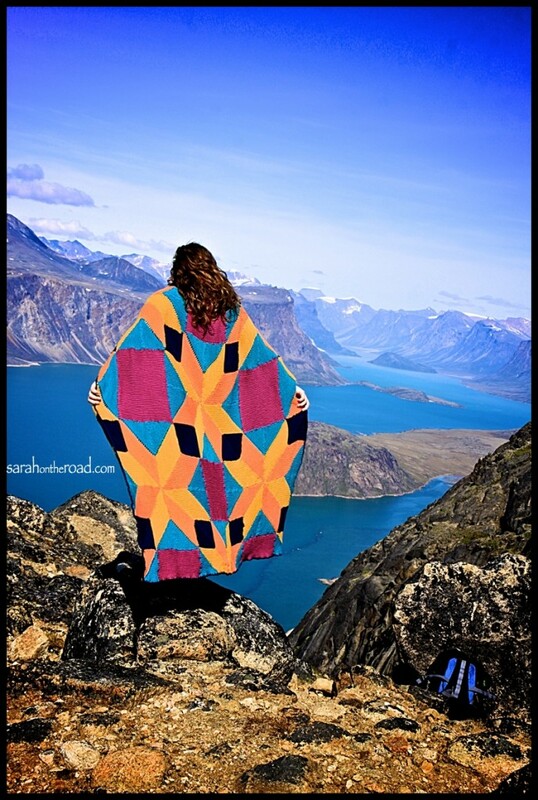 I was in love with this image from the book, and wanted to recreate something like it with me and MY afghan! So I decided to take it with me when I went on my ‘little’ walk up Mt. Duval last weekend. I couldn’t believe it only took me about 2months! The Book I used “Comfort Knitting & Crochet Afghans” has so many great options… I’m starting to think about my next project. If I do another afghan I really like this one, Autumn Haze! 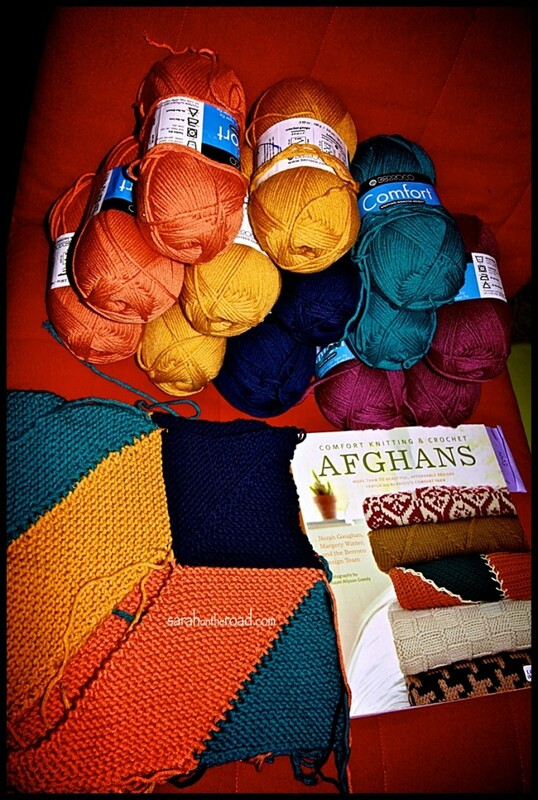 As I was writing this post I was sitting at home, with my afghan on my lap. The temperatures today dropped down to 5C… (I had to turn on the heat again in my house!) 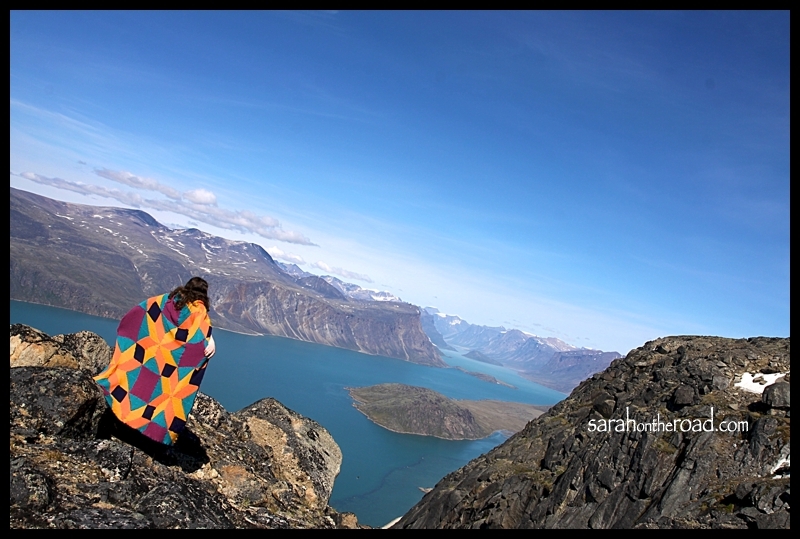 I posted an Instagram photo of my blanket on Facebook and friends are telling me it’s crazy hot in Ontario right now. Why does that matter? Well if all goes as planned (the fog/weather/flight delays) don’t get in my way…just be a short 3 flights away from Toronto! 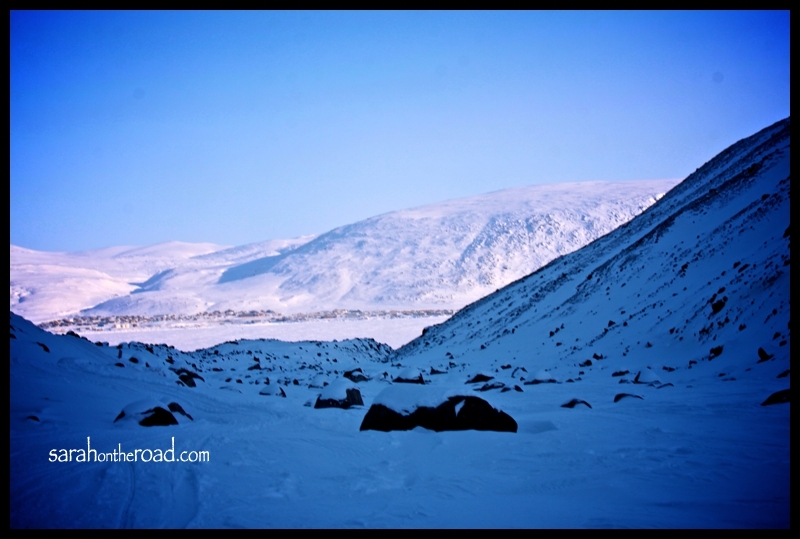 I’ll let you know how that adventure goes… travelling in the north is always fun! * thank you, Sager for taking the time during my short 36hour visit with you in January to get the wool…without you I wouldn’t have been able to do this. * Also thanks to my friend in Pang that inspired me to knit beyond a baby sweater! I’m still not 100% sure about those scary things like ‘cables’ and knitting with 3 or 4 double pointed needles. But I’m sure with your knitting mentorship I will be just fine! Maybe I’ll work on some socks or leg warmers next? 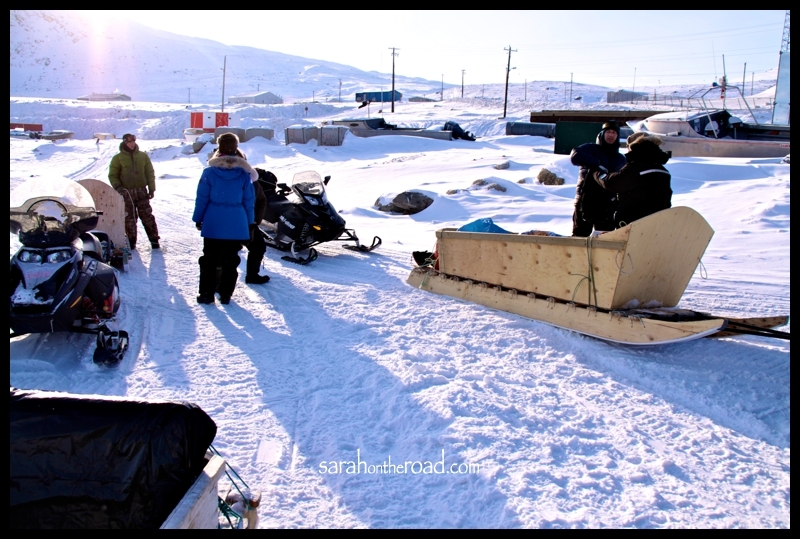 This entry was posted in Life in Nunavut and tagged 32 Things to do by the time I'm 32 on July 5, 2012 by Sarah on the Road. 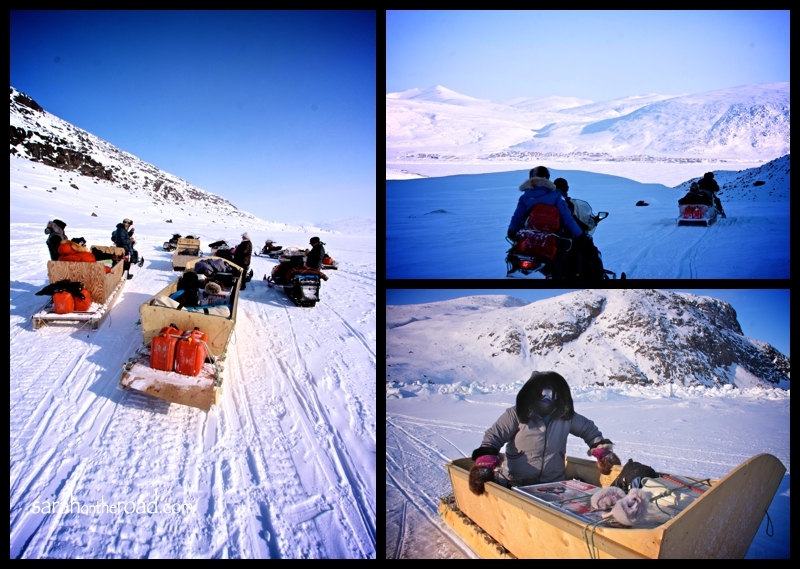 Today my coworkers and I headed out on the land to go ice fishing at Iqalukjuak. 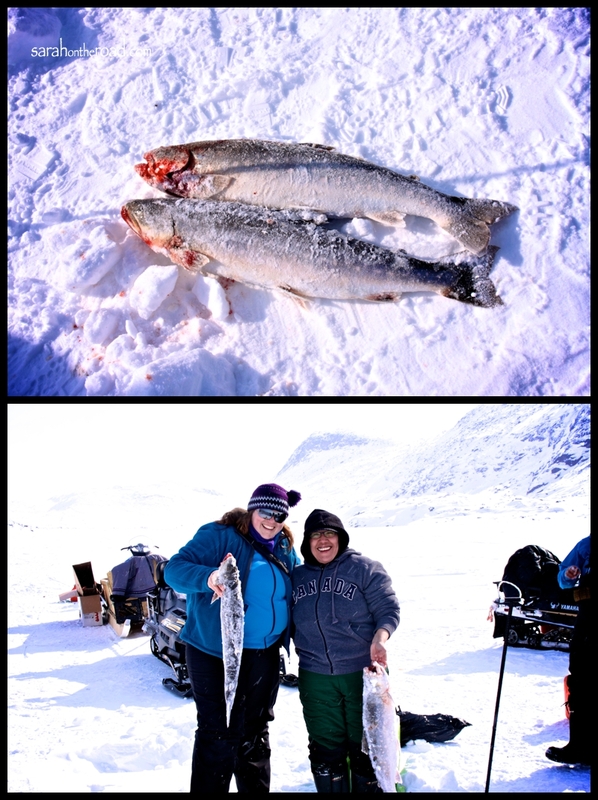 Iqalukjuak means Big Fish in Inuktitut. It’s about a two hour (maybe a bit more) drive from Pang. Here’s a shot of the lake…. We met at the ‘beach’ early this morning around 7am before heading to the lake! 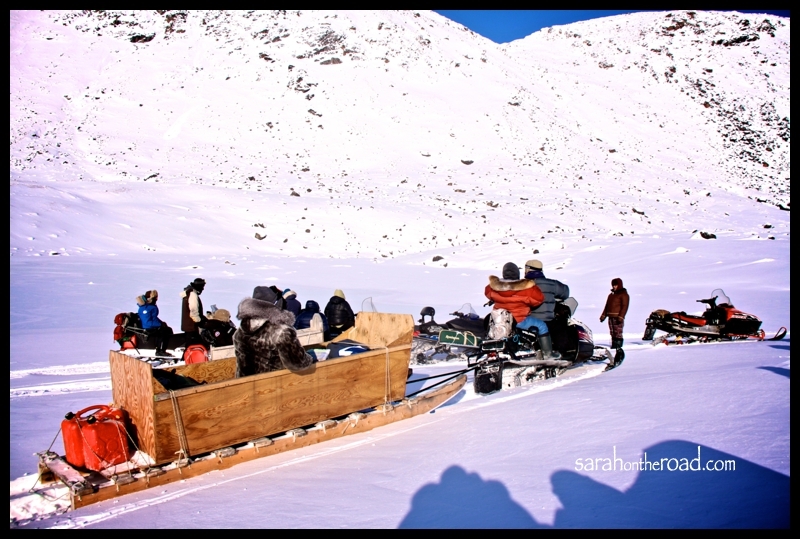 There was some organizing of who was going in what kamotik or skidoo… then we were off! Views from the trail… today was such an amazing day! 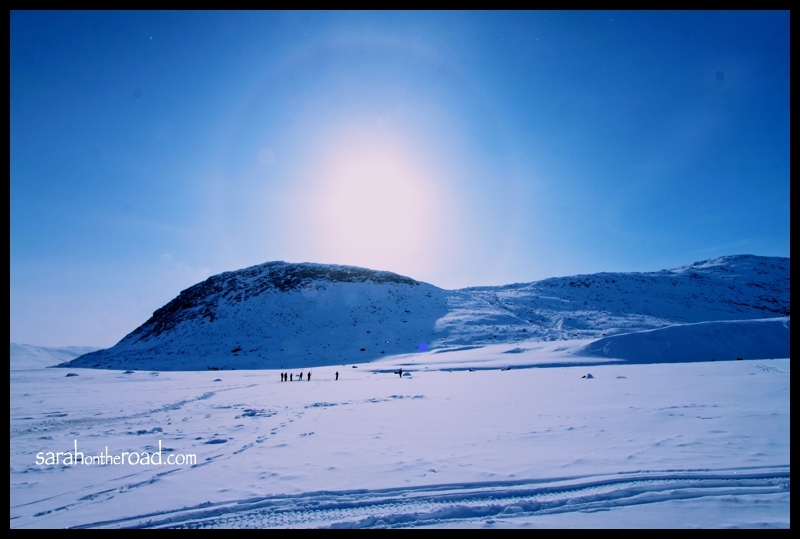 Blue skies…great people…and tons of fish… It’s finally warm enough to be able to head out to enjoy the snow. 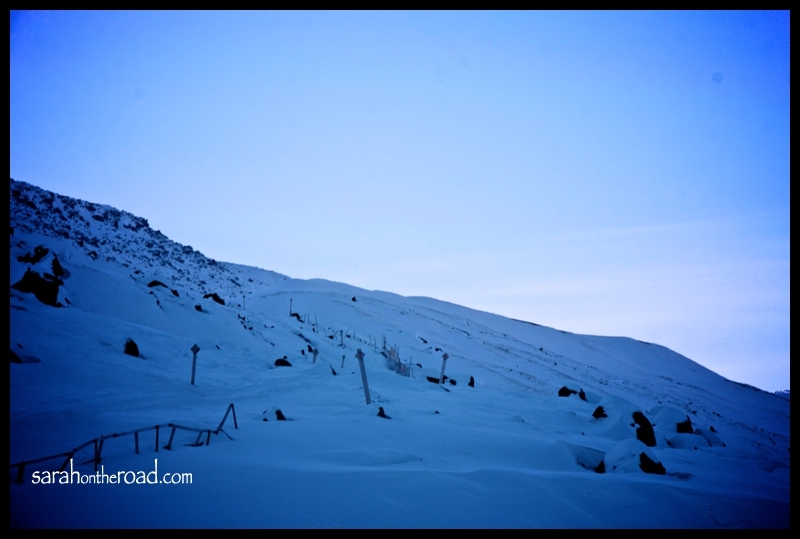 And there’s still heaps of it up here! The kamotik that was my ‘ride’ for the day. I actually don’t mind riding in them… it’s a fun, a bit bumpy… but alright. Today this was the part of the trip that worried me… I fell last week wearing my kamiks inside my friend’s kitchen. I fell hard, legs went out from under me…and went from standing to sitting with my legs out in front of me in a V. It was a HARD fall… and my tailbone isn’t happy right now. For the ride out I knelt in the kamotik, holding the sides of it to steady myself on the bumps… then coming home I was tried resting on my side/hip… and ended up coming home that way. So that’s the way I got around SITTING and bouncing on my tailbone for 2+hrs! 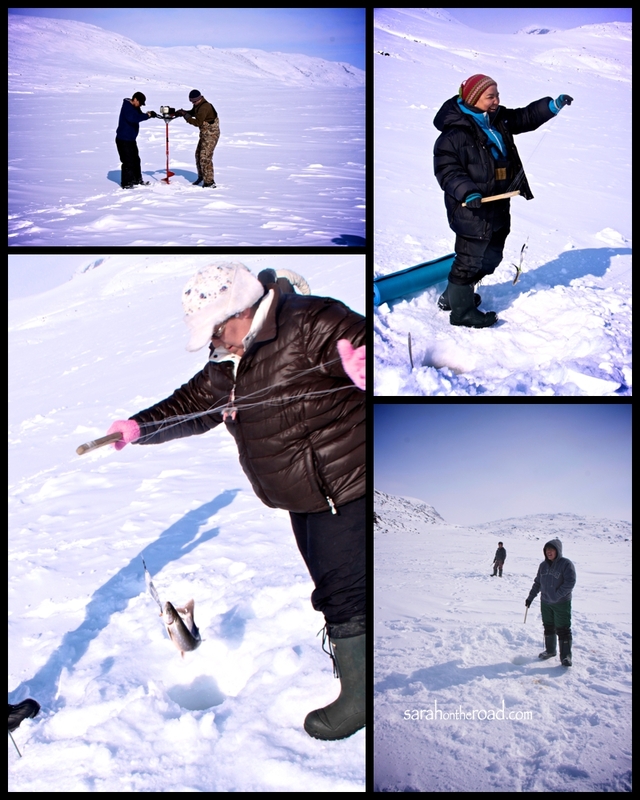 …it was amazing after getting to the lake, we started getting holes in the water…and fish started getting pulled out of holes everywhere! 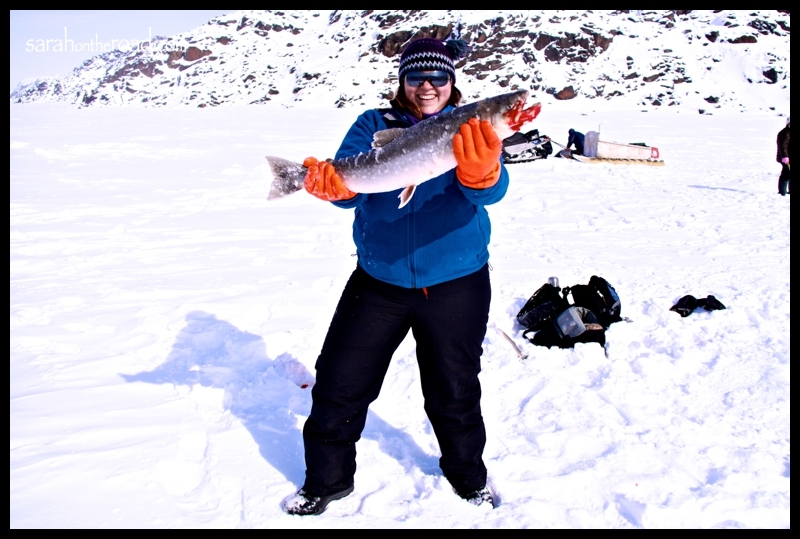 My Iqalukjuak..it was the 2nd fish I caught today, but the 3rd in my life I’ve EVER caught. I gave it to my friend to share with her family–it was just TOO big for me to eat on my own and I didn’t want to waste any. Char is always better FRESH…For my family, don’t worry when I come south in the summer… I’ll bring some ‘big’ ones to share with you! There were three prizes given today. 1. First Fish Caught 2. Biggest Fish and 3. Smallest Fish. I won for the ‘smallest’ fish… I’m holding it below! Also there’s a photo of me just after I caught my first fish…literally happened within the first 5mins of starting jigging! These are the two ‘biggest’ fish from the day… Mine is the bottom one, not quite the biggest-but close! My coworker and I showing off our catch! 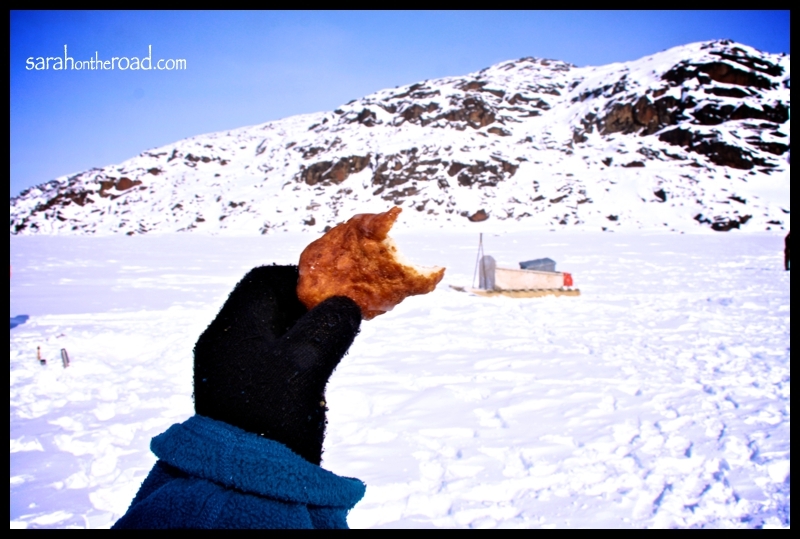 One of my co-worker’s made her amazing bannock…she calls it “Move over Tim Horton’s” because it’s WAY better than any Tim’s donuts I’ve EVER had!…Here’s mine that has a big bite out of it! 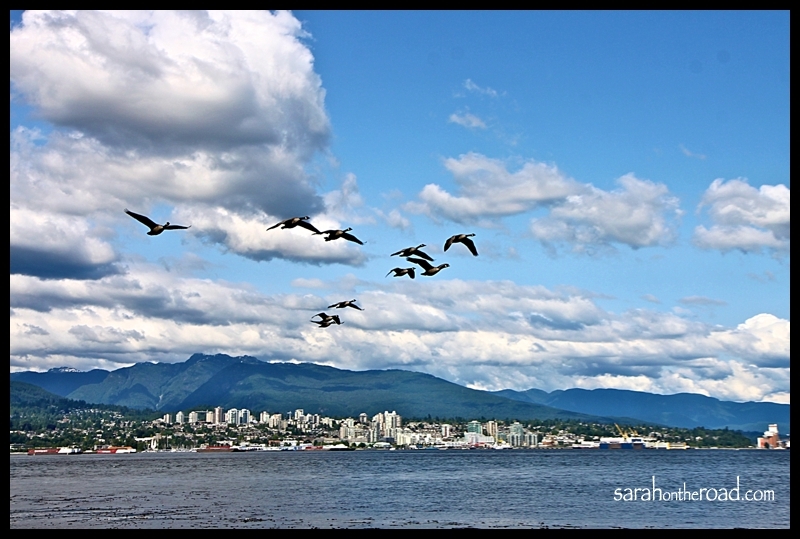 Here’s some views from around the lake…. We stopped at the River on our way back to town…overall it’s really shallow, and the ice was really thin with some ‘open’ spots! 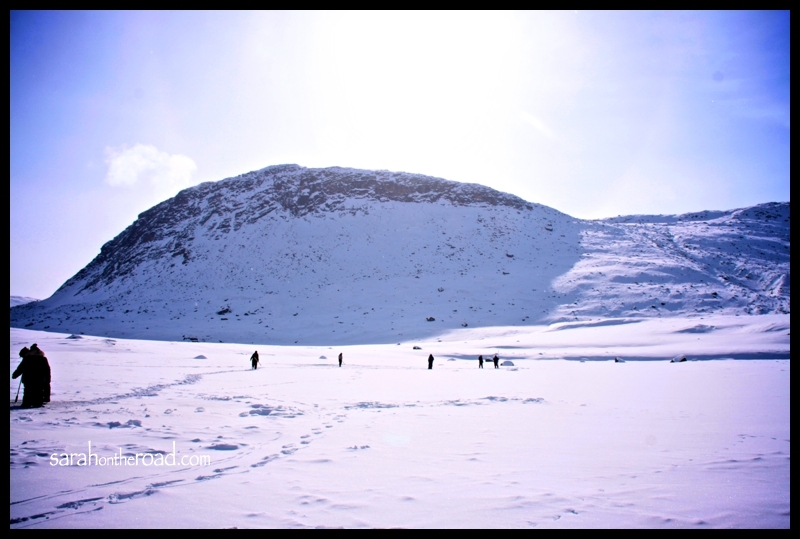 But that didn’t stop people from catching fish…I just wandered and took photos! It wasn’t very ‘bright’ and the photo doesn’t really capture what I saw, but there was a FULL rainbow around the sun! 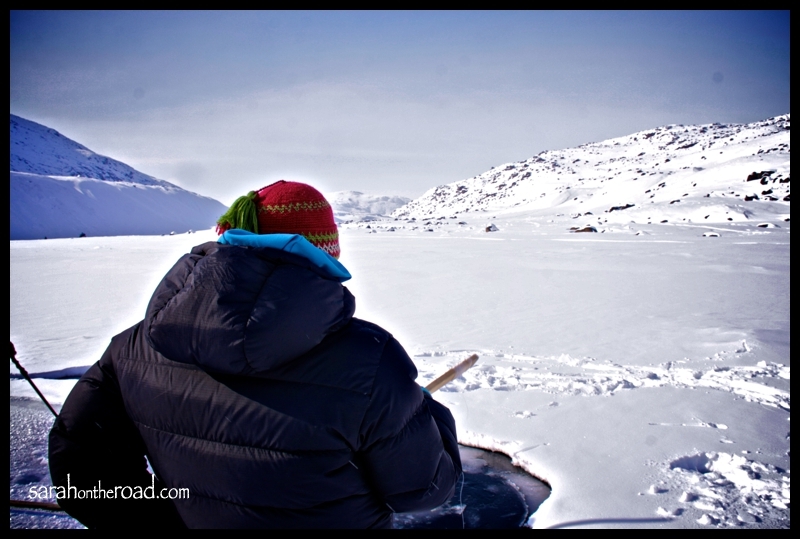 Then it was time to head home… a shot of me ‘kneeling’ in the kamotik! 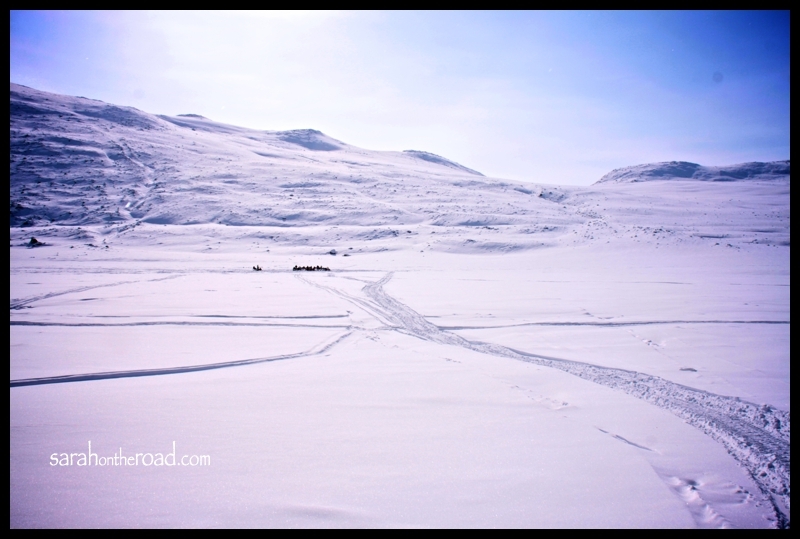 Today was my first time on the Kulik River Trail… I’d heard stories about it. 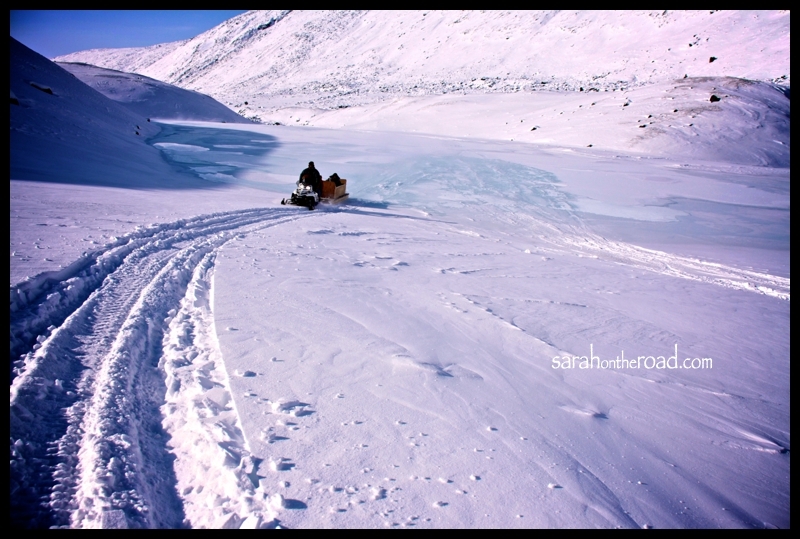 There’s a spot at the beginning of trail that’s incredibly steep, and very narrow… going up I was a bit freaked out, but totally trusted the person driving the skidoo that was towing the kamotik! Off to the side… is a very ‘steep’ crazy drop to the river below. Below is a photo from the bottom of the ‘steep’ part. (it’s hard to actually see the trail.. and how crazy-narrow-steep it is… the trail winds up to the top of this photo…) Someone has constructed a ‘fence’ to stop you from going off the trail and rolling off the edge! 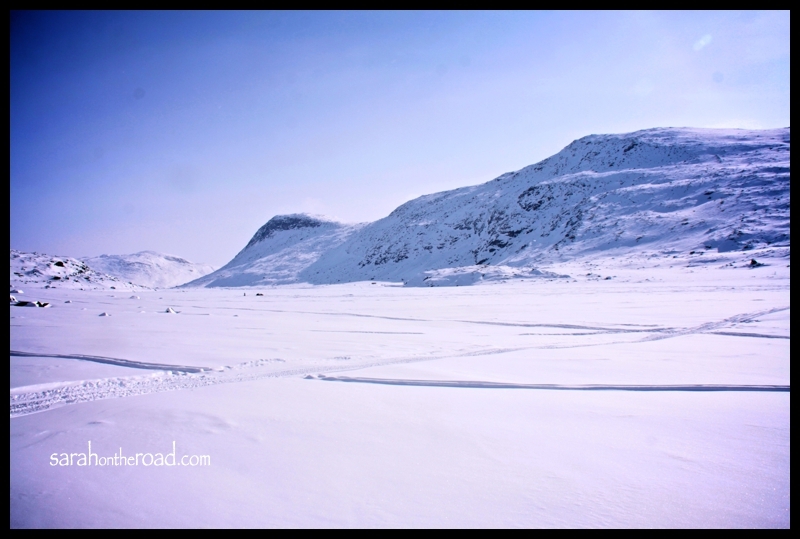 The view from across the fiord, almost home! 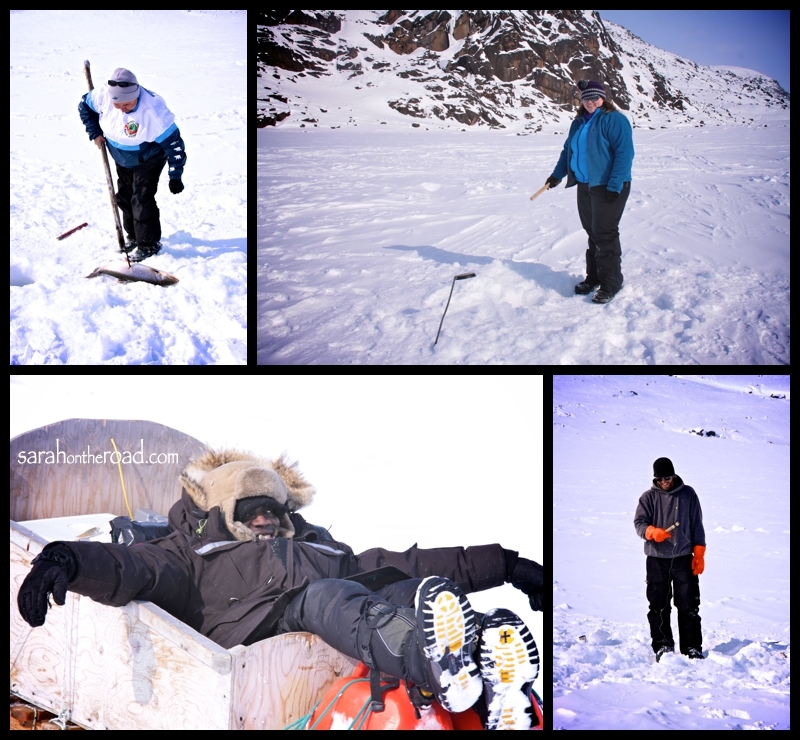 Today was an amazing day…I had a BLAST…the bumpy ride in a kamotik was so worth it. I had many reminders today of how blessed I truly am to live where I do, and experience the things I am experiencing. I work with some amazing people, it was great to spend a day out on the land fishing with them. Can’t wait until the next time. 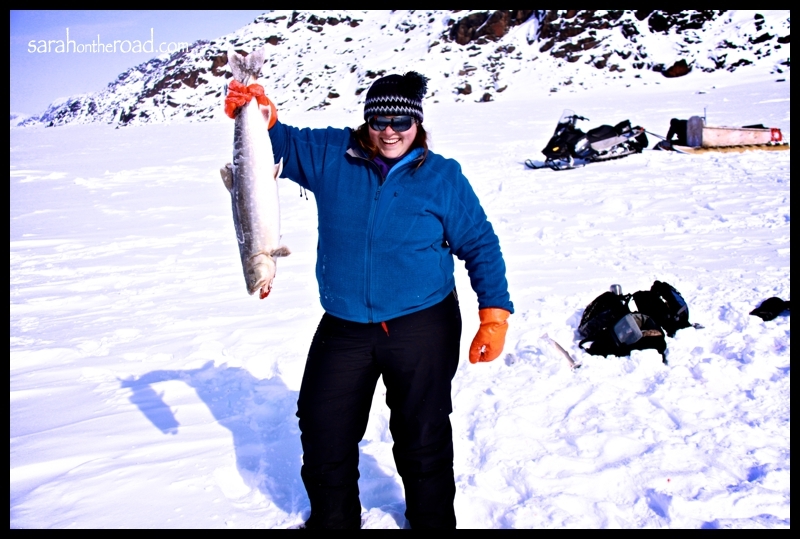 UPDATED: I just realized I crossed off another thing on my “List of 32 Things to do when I’m 32”…Number 19: “Go ice-fishing and catch an Arctic Char..or at least attempt to”… YAHOO for checking another off the list! 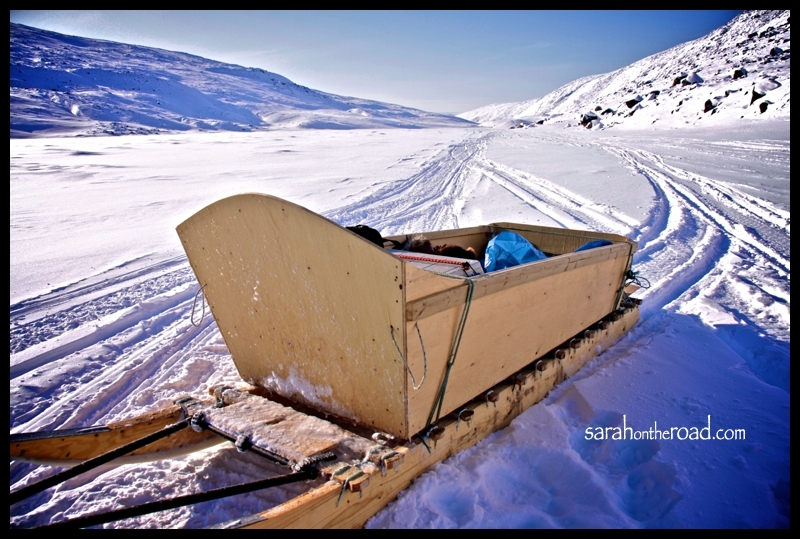 This entry was posted in Fun with Work Mates, Life in Nunavut and tagged 32 Things to do by the time I'm 32 on April 19, 2012 by Sarah on the Road. When I got home from my day spent celebrating Pang’s 40th Hamlet Day Anniversary I had an email from a friend. 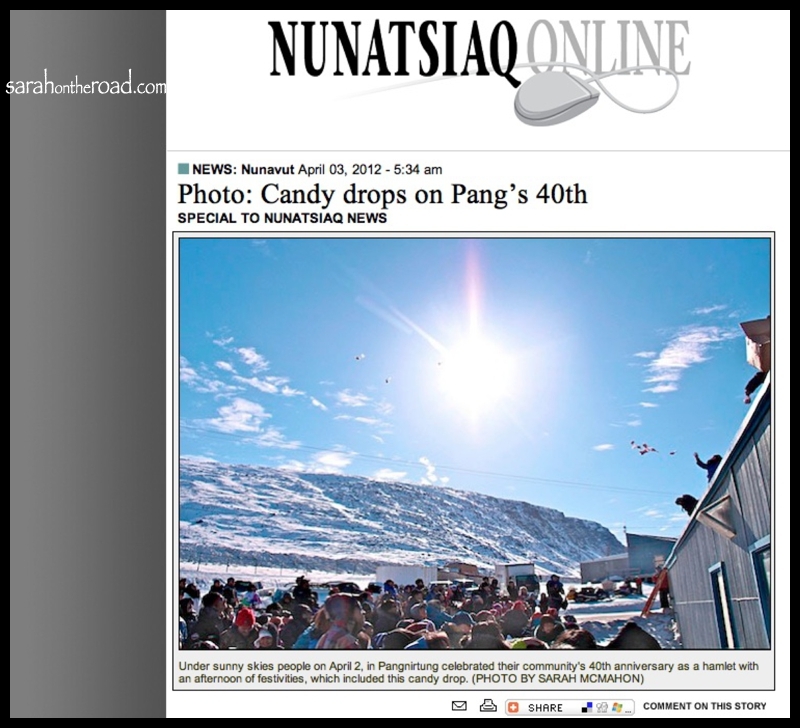 This friend had been contacted by someone from Nunatsiaq News and they were wondering if there were any photos from the day’s celebrations they could use in their publication. I emailed them a few photos that evening and more in the morning…and 4 were chose. 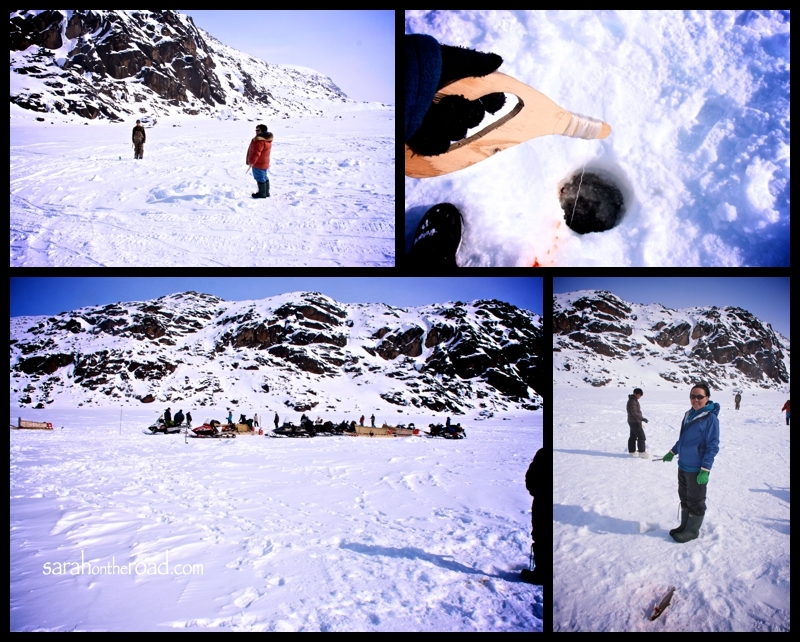 These photos were posted throughout the day on Nunatsiaq’s Facebook page…and on Nunatsiaq Online, their website! Because I’m a bit of a ‘geek’ I took a ‘screen-shot’ to remember seeing my photos where in an online publication! It’s been a bit surreal and crazy amazing experience… It’s been an amazing opportunity to allow more people to see more of my photography work! The other really nifty thing is that tonight I realized that having this happened has helped with #27 on my List of 32 Things to do When I’m 32… two things done-still many more to go! 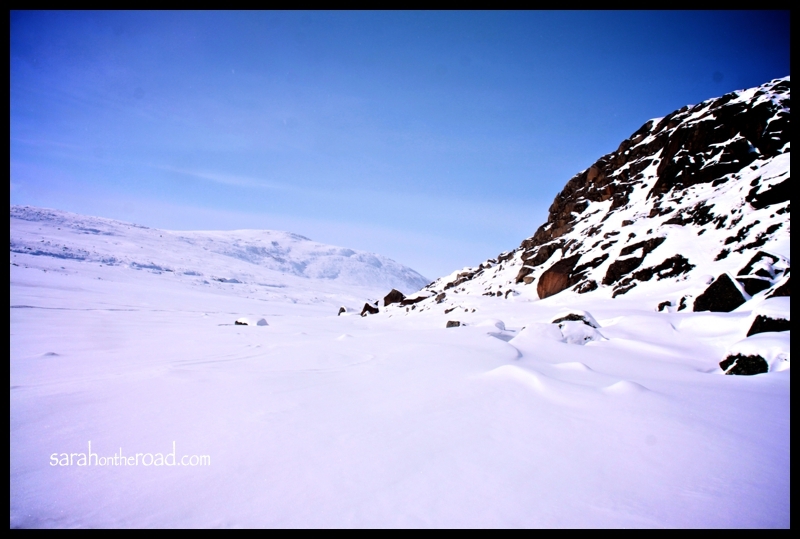 This entry was posted in Life in Nunavut, Photography and tagged 32 Things to do by the time I'm 32 on April 17, 2012 by Sarah on the Road. 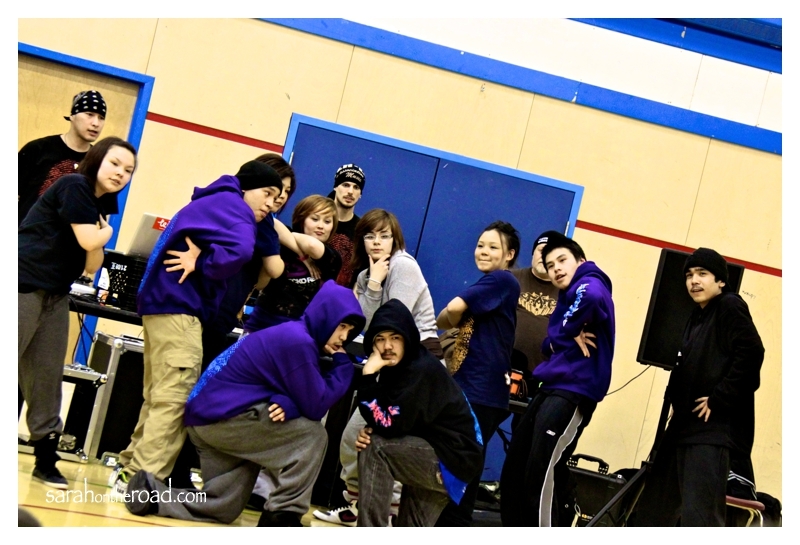 Hip Hop, Bingo, Sushi and Roasted Chicken…OH MY! 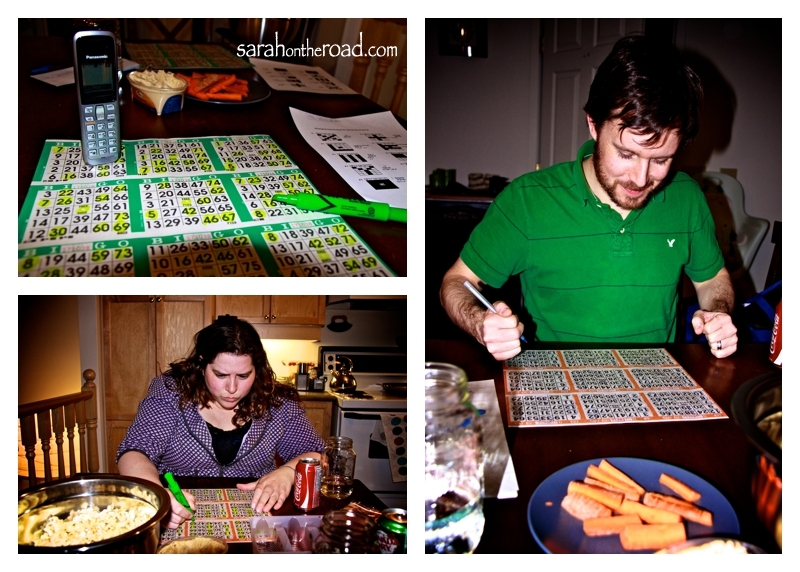 What do Hip Hop, Bingo, Sushi and Roasted Chicken and good friends have in common? At first glance, you might say that’s a random list of things that don’t relate at all…but this weekend they all played a role in helping me have a really FUN WEEKEND! After last weekend of my 2 day self inflicted-pj-hibernation that had activities of tv watching, sleeping, knitting and reading…this weekend I was ready to get out and have some fun with friends. It was a jammed packed day and was packed with lots of fun social stuff. 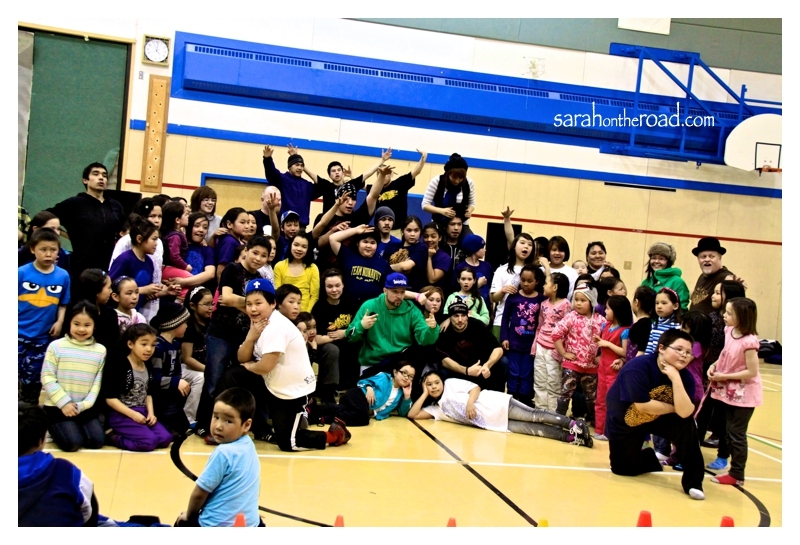 Blue Print for Life was in Pang last week doing workshops with the kids ages 10-13. The really cool thing was that the older teens were young leaders for the week…and helped mentor the younger teens in the various activities. On Friday night, there was a hip-hop showcase to show the community their moves. It was really an awesome show! Here’s a shot of the dancers at the end of the performance. It started off with a little bit of throat singing, and then beat-boxing… It was so cool-it made me wonder, how do people realize that they can make sounds like that? How does one discover that they are a talented beat-boxer? I suppose they just try. After they pulled up the Mayor and someone else to try their hand at DJing…which was pretty funny… (they were using a drum box thing, and ‘scratching’ records? (is that what it is called?) 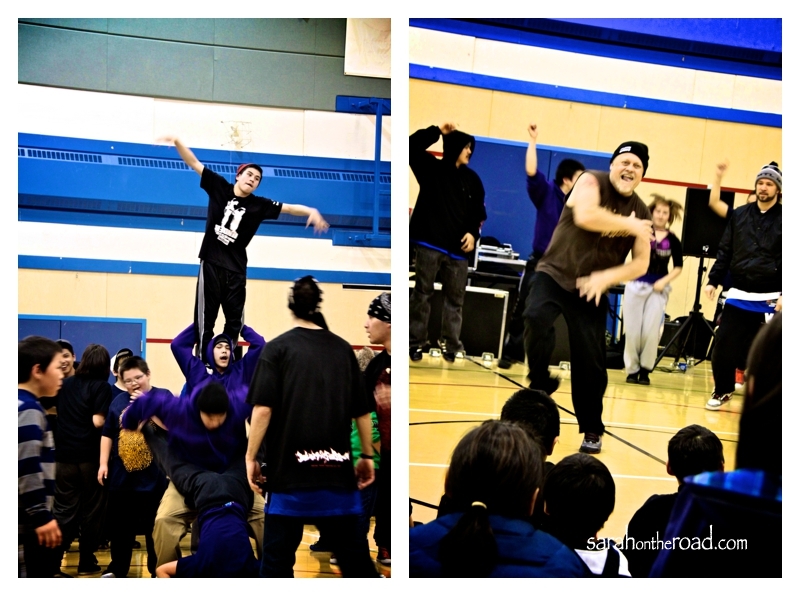 There were 5 group performances where the youth leaders created routines for their groups to dance… pretty neat to see the kids dancing and having fun. Then the 4 leaders from Blue Print for life danced to introduce themselves…which turned into a big hip-hop circle of random teens challenging each other in dance…and taking a turn showing off moves! I took a few photos, but mainly watched below are some of the ones I took! Dancing up a storm at any age! Stephen (Buddha) Leafloor shows he still has moves...and can keep up with the teens on the floor! 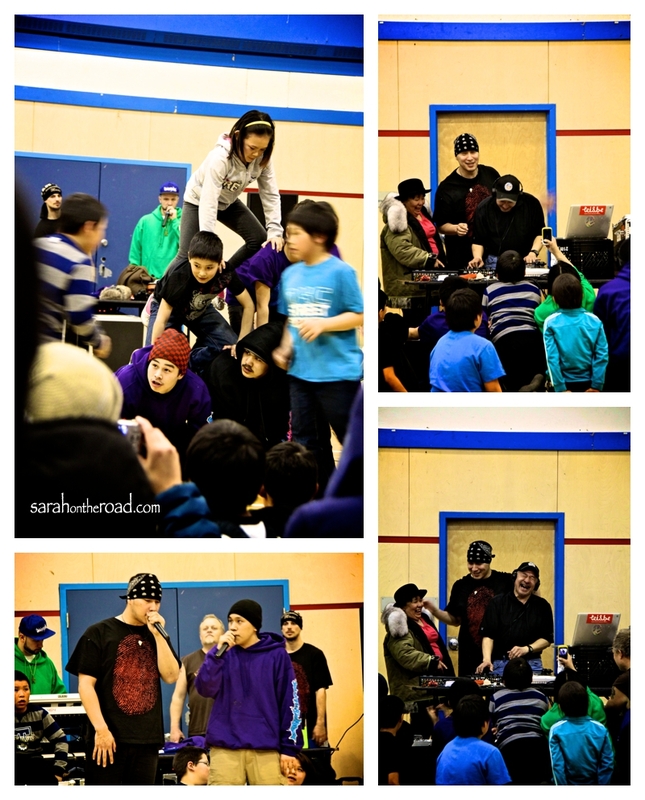 My thanks to the youth of Pangnirtung for an awesome show… can’t wait to see their next performance! Saturday night brought more fun at my house. I invited over a few friends to make sushi. Making sushi was Number 7 on my List of 32 Things to do when I’m 32. It was such a fun night, and making sushi was so much easier than I thought. 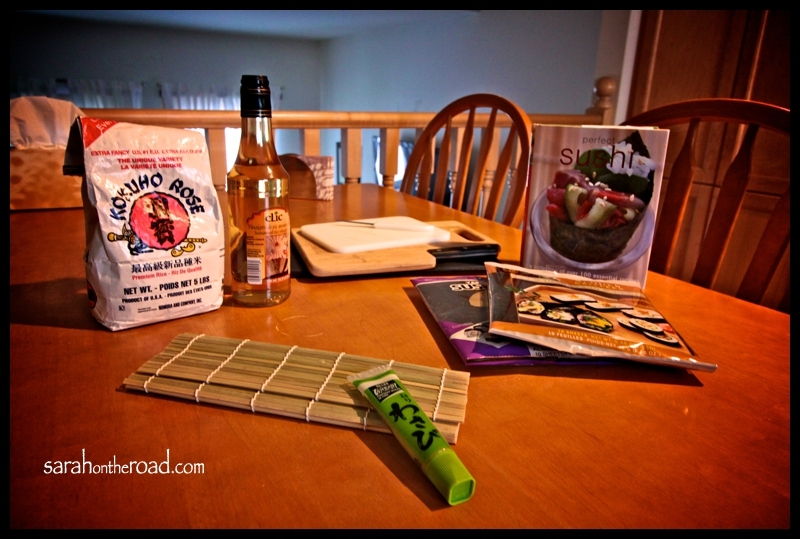 Some of the supplies… Markus and Delia lent me their sushi cookbook, “Perfect Sushi”. 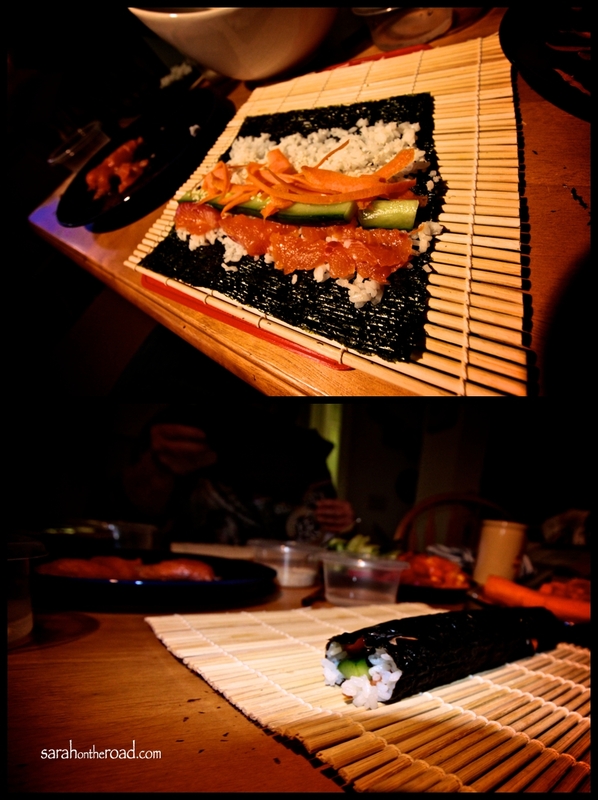 I’m totally putting it on a list of things to get myself…such good sushi recipes AND pictures. 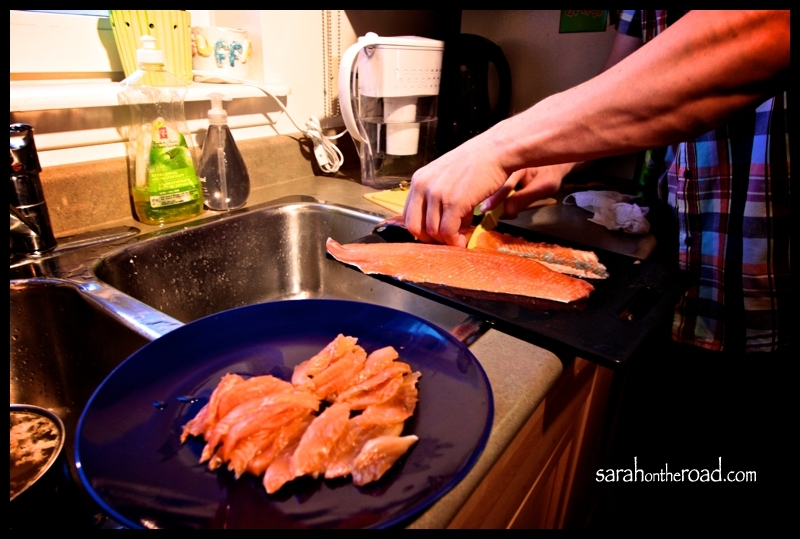 Markus was fishing for the day…and brought back FRESH Arctic Char for us to use in our rolls. Mary and I cut up veggies… cucumber, red and orange peppers, shaved some carrot and cooked some egg (Sadly there were no avocados at the Northern or Coop!). I had cooked the rice-using the Sushi Cookbook instructions…(no photos of those parts!). Then it was time to start rolling… it took a little bit to get knack of making it happen. But basically you add rice (leaving a strip at the top and bottom)…then layer up as much ‘insides’ as you want…make your own combos of veggies…and you can sprinkle some sesame seeds inside the roll before you roll it up! It took me a bit to figure out how to use the matt to roll it all up… but after a few instructions, and watching the other ‘seasoned’ sushi rollers sitting around my table… I was off. A photo of my FIRST sushi ROLL! The sushi rolls started piling up…. then we cut them… and ended up with TWO plates stacked FULL of SUSHI! Markus brought Miso Soup mix… which was an awesome addition to the meal. I didn’t take a photo of dessert–but I made baked apples that Tara made for me when I was in Kug. They were as good as I remembered! 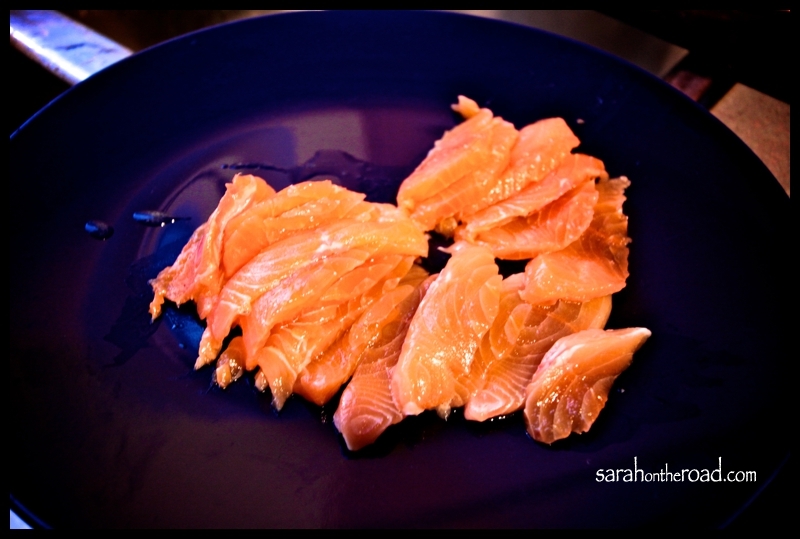 As for more sushi parties, I just need to get a few more ‘supplies’ so I can make some more. Which might be an issue of trying to figure out how to get some more sushi rice, nori, miso soup mix up here in Nunavut. I think I need to get a set of chop sticks, and small bowls to mix wasabi and soya sauce. Thanks Mary and Markus for teaching me how to make sushi… I hope you both had as much fun as I did! Number 7 on the list is DONE! If that wasn’t already a perfect evening… tonight I had cooked my first EVER roasted chicken, mashed potatoes, steamed carrots and canned corn. Nic, Shannon and Baby S came over to help me eat it! I didn’t take any photos..but it was incredibly yummy. Thanks for joining me for dinner–it’s nice to eat with someone once and awhile! I suppose this is where I make a wee bit of confession…as much as I protest about being a ‘bad’ cook, and total disaster in the kitchen, soon I’m not going to be able to say these things about myself–I’m actually gaining some mad cooking skills. But sometimes I don’t follow the instructions, and decide to walk on the wild side…and wing it! This weekend that worked for me, but I must admit sometimes it doesn’t! 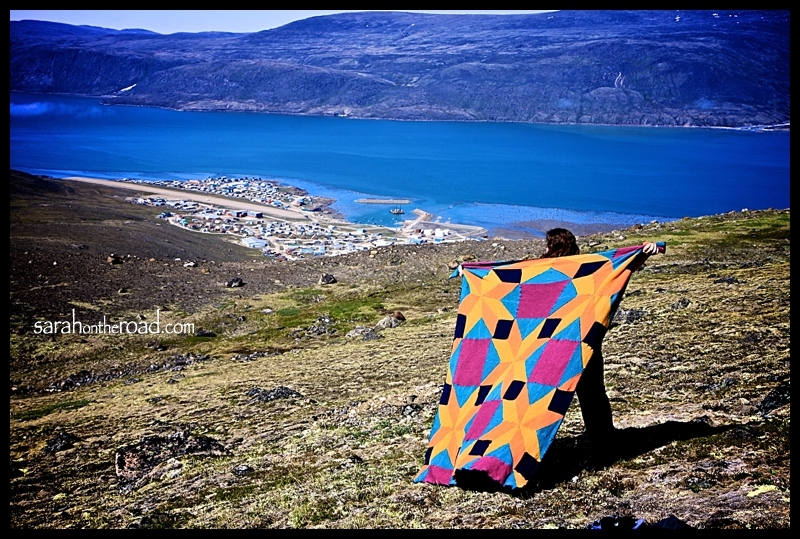 This entry was posted in Life in Nunavut, Whirl-Wind Weekends and tagged 32 Things to do by the time I'm 32 on April 1, 2012 by Sarah on the Road.